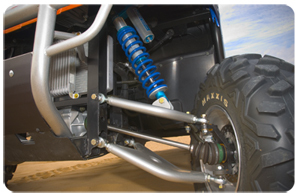 Yamaha Rhino's come stock with fully independent four-wheel suspension: Double-wishbones front and rear deliver 7.3 inches of wheel travel and 12.1 inches of ground clearance. 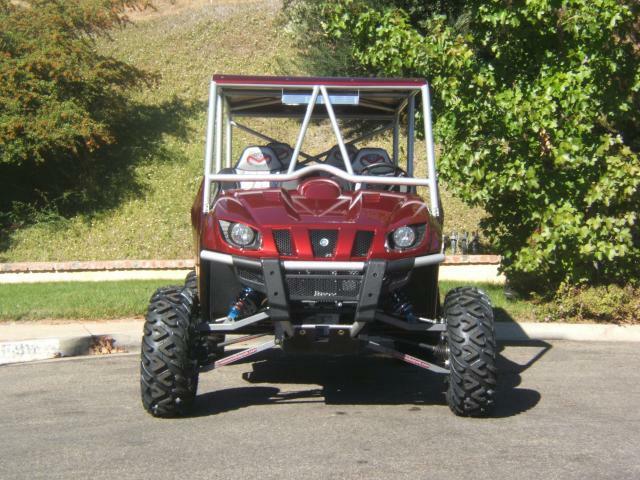 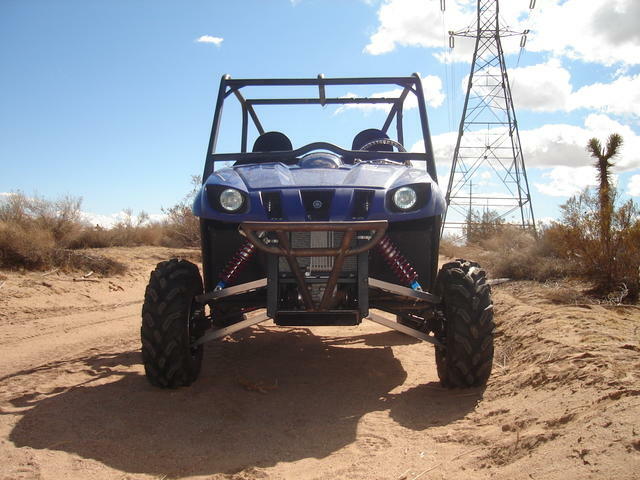 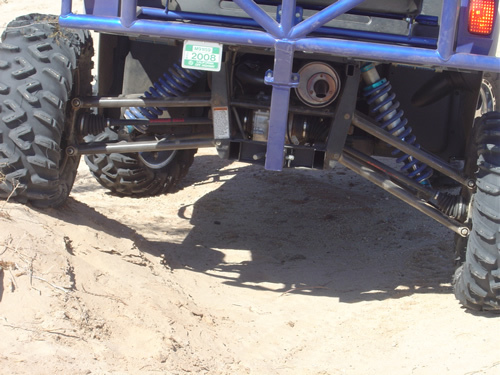 Stock Rhino's have a 75" wheelbase, and are 54.5" wide. 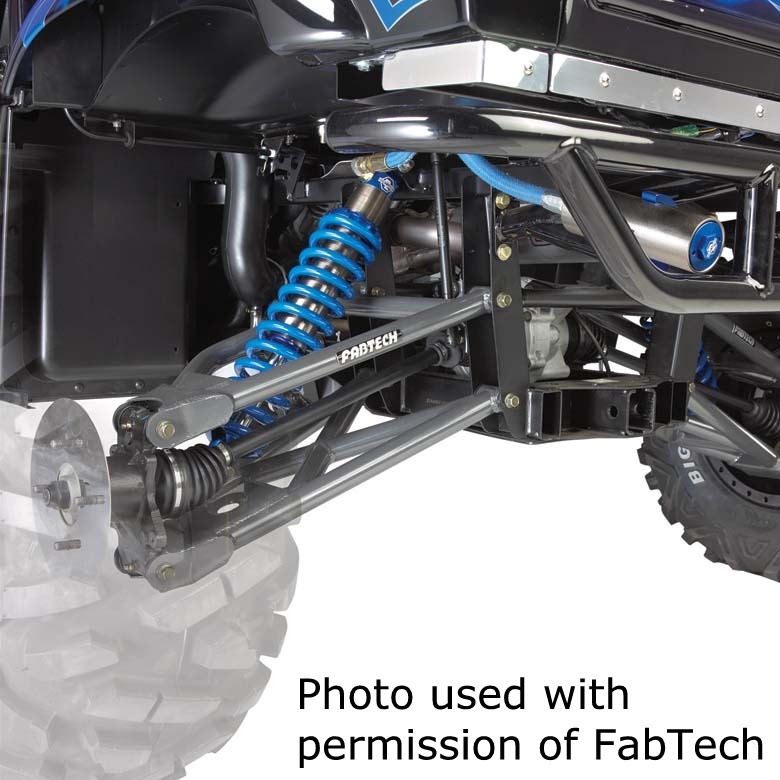 Decent for easy trail rides, but with stock-width a-arms, it feels like it could tip on side hills, or run out of suspension going through the whoops, jumping or hitting a witches eye. 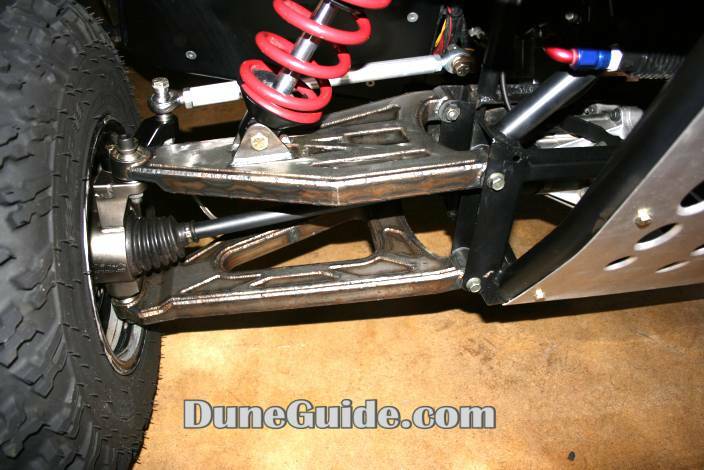 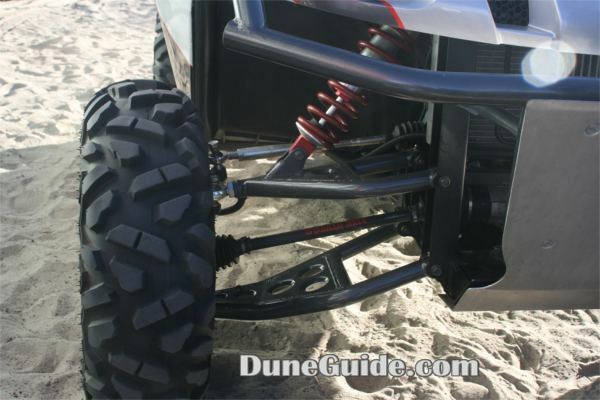 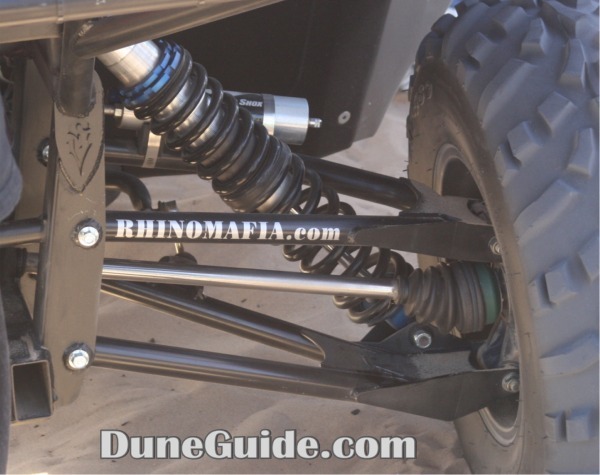 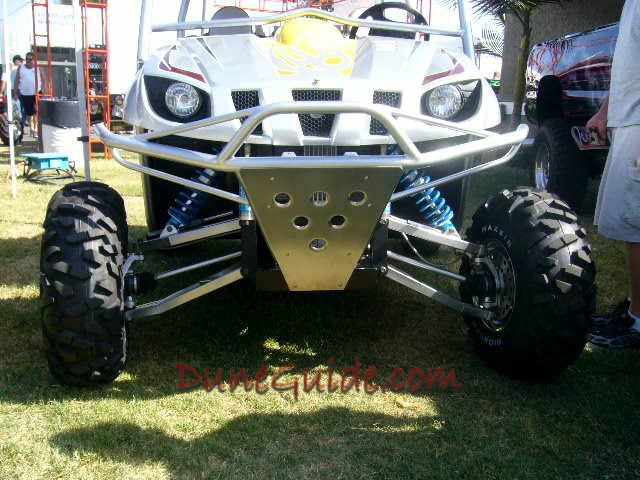 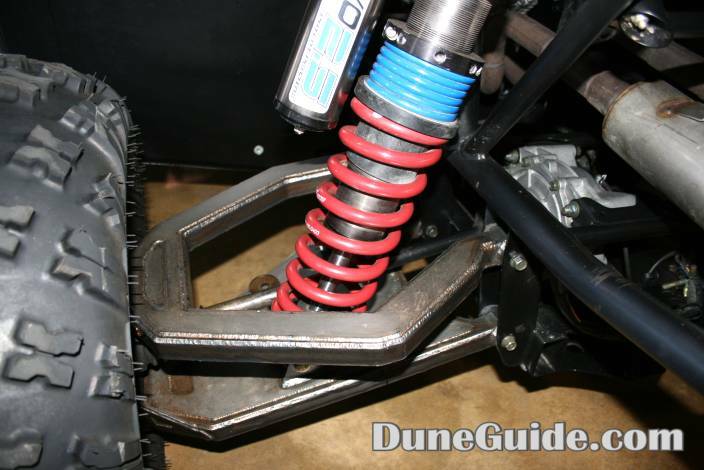 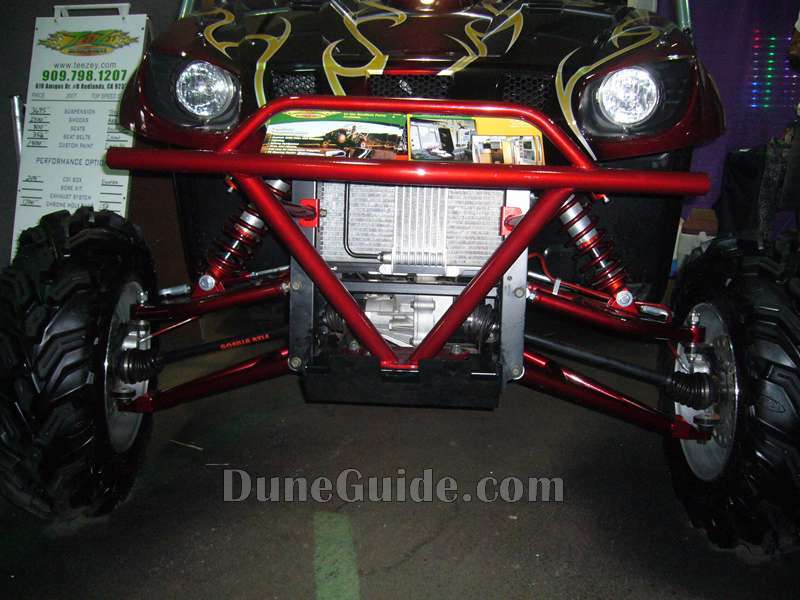 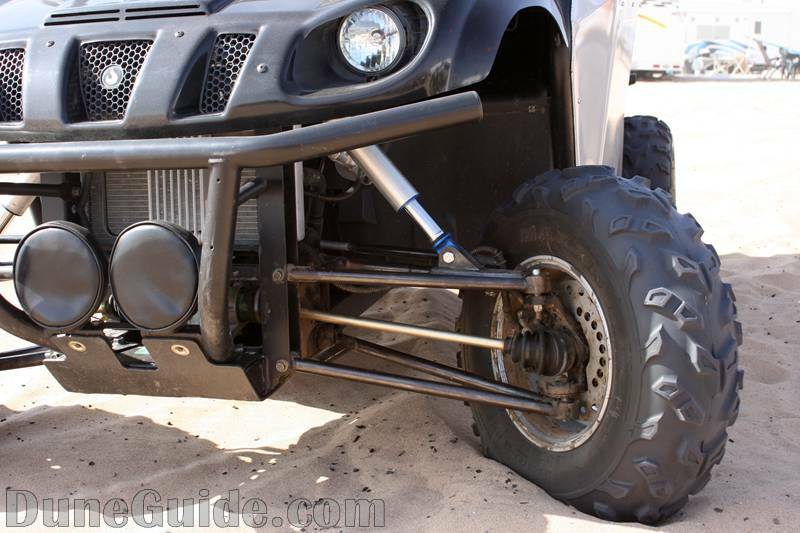 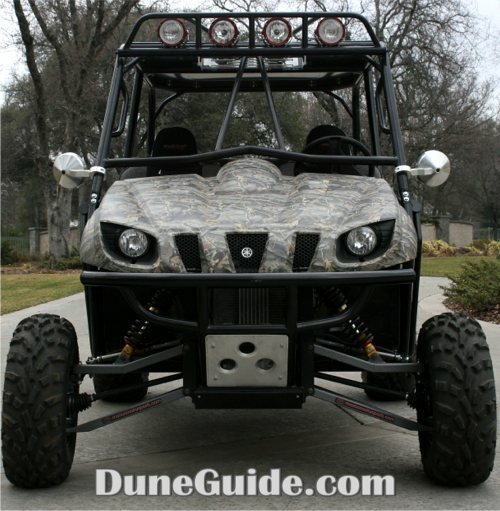 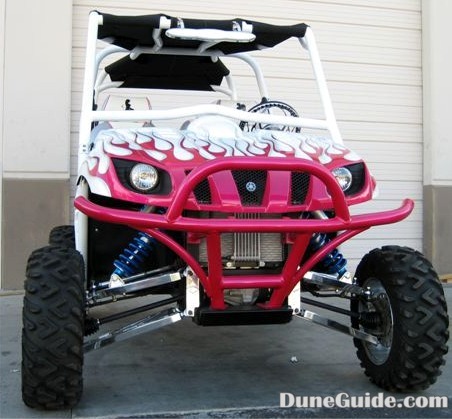 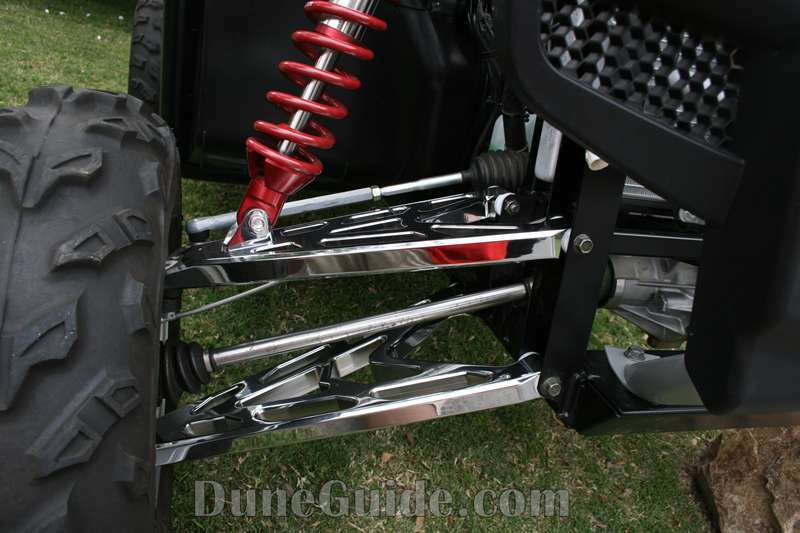 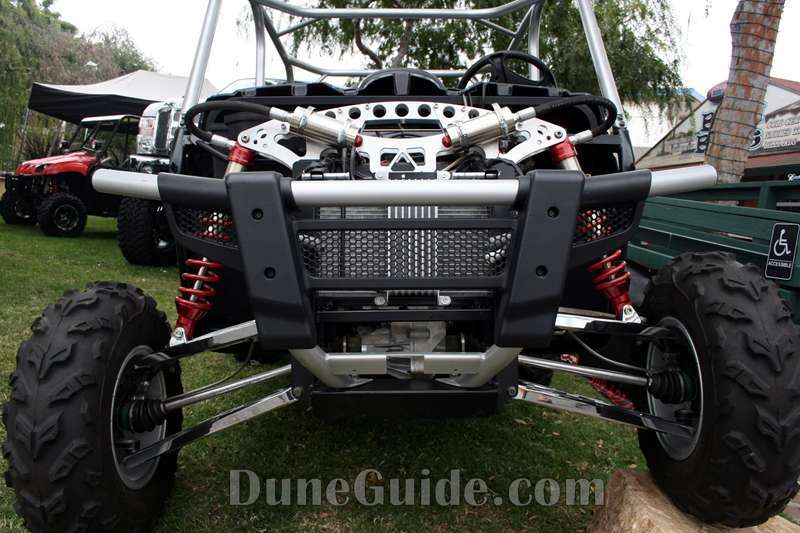 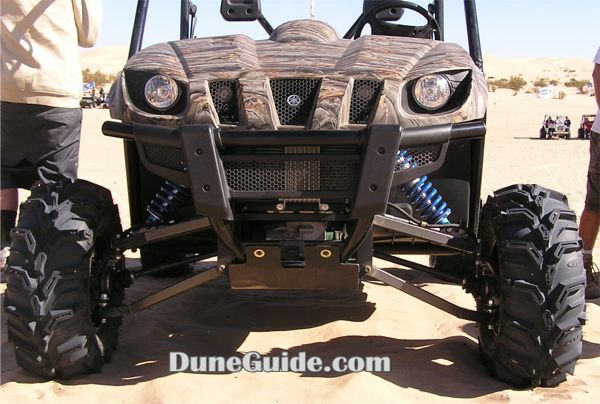 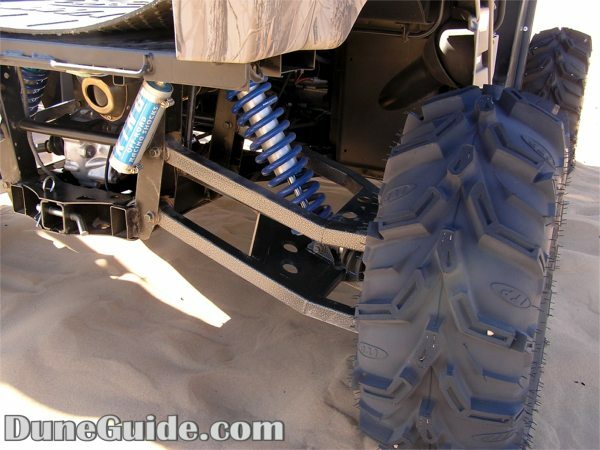 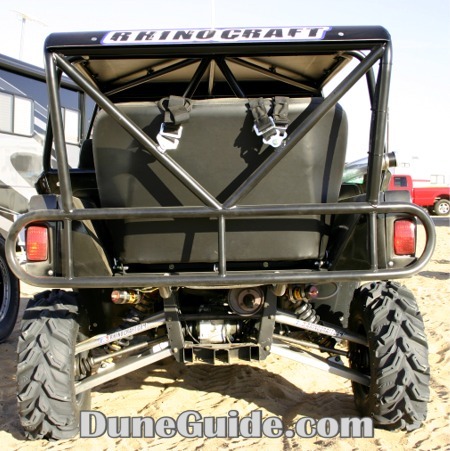 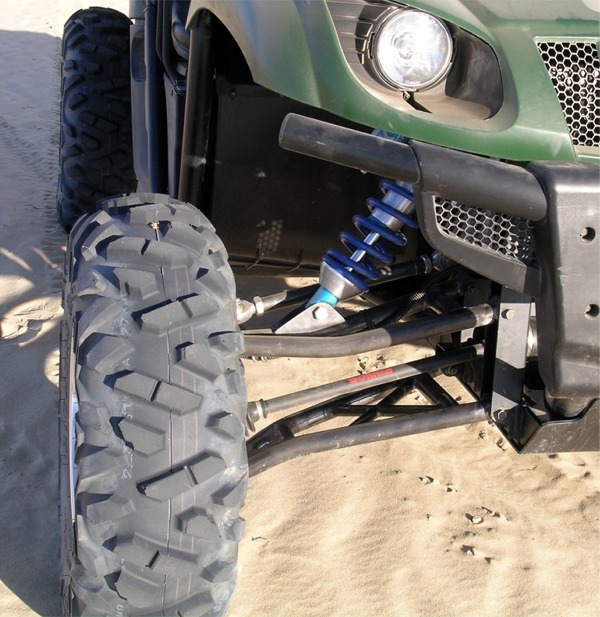 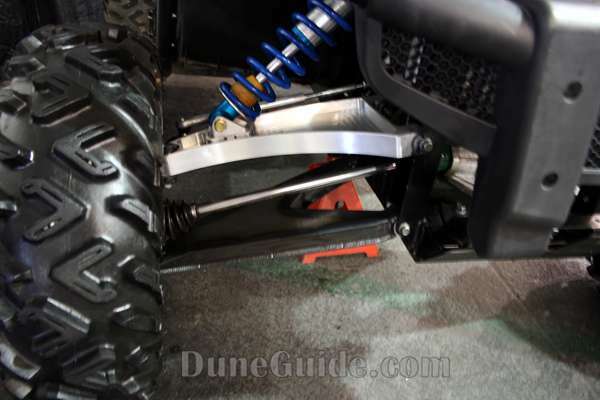 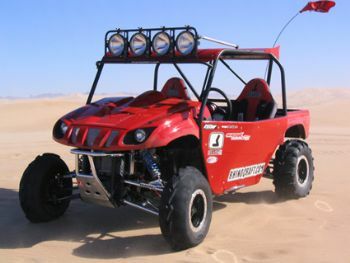 So if you are serious about taking your Rhino for hard dune rides, either invest in some aftermarket suspension, or know the vehicle's limits. 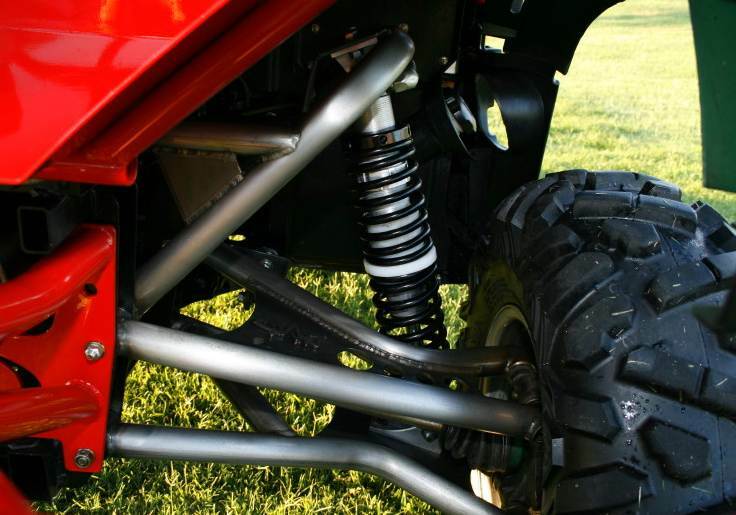 Although long travel kits are far from cheap, they are the best way to improve your Rhino's suspension. 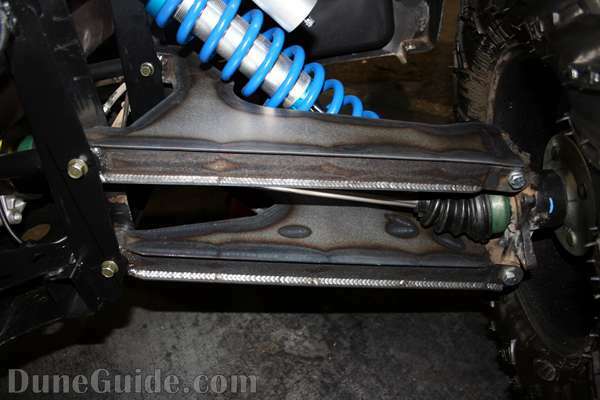 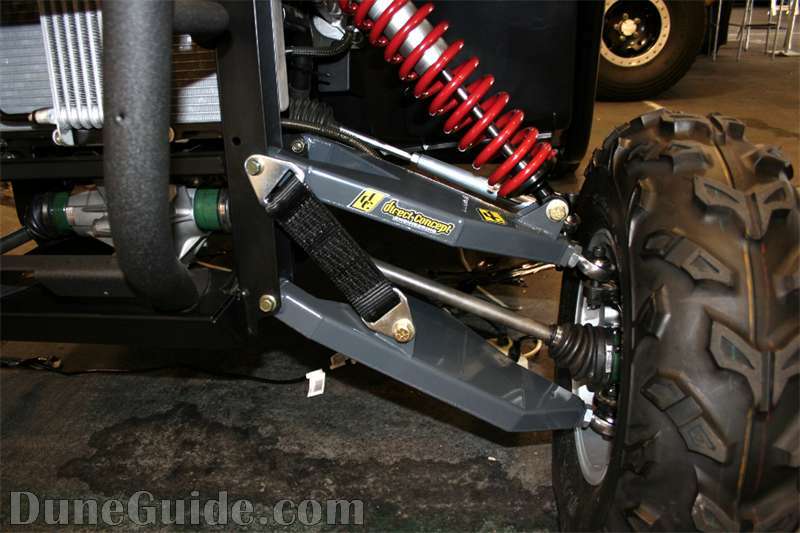 Approaching the goal of long travel in steps can result in more expense because stock length shocks will not work (the only exception to this is Lonestar Racing MTS mid-travel kit). 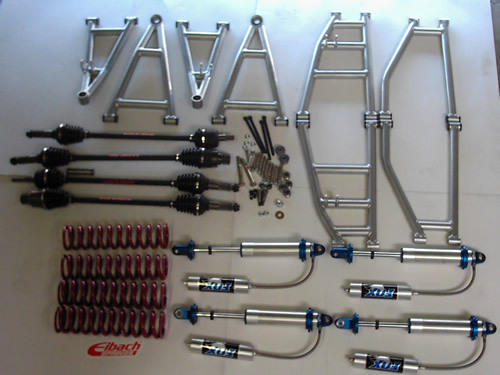 It is a hard pill to swallow, but if you want to get to long travel, you will save money in the long run by waiting until you can buy a full long travel kit. 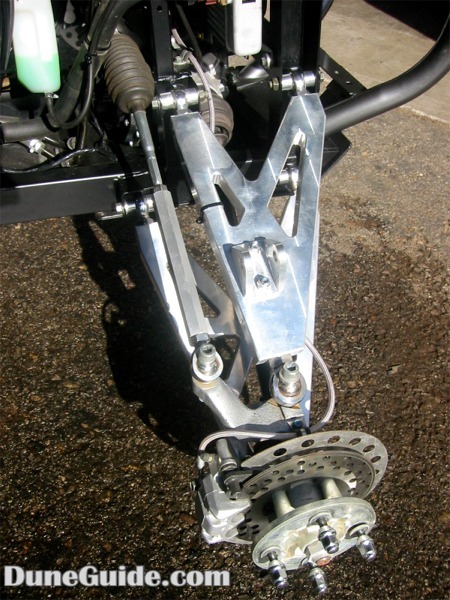 Most of the long travel kits increase wheel travel, front and rear track width and stretch the wheelbase. 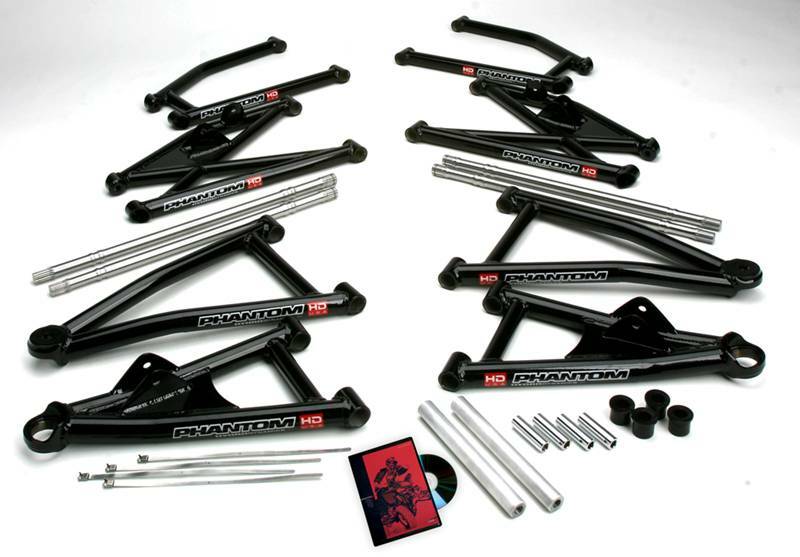 Long travel kits are now available from several manufacturers. 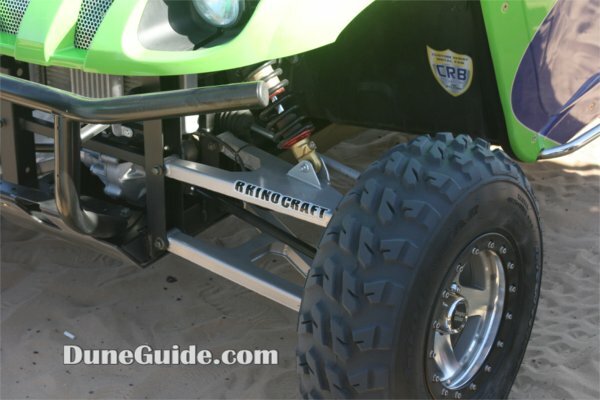 What is included in a Rhino Long Travel Kit? 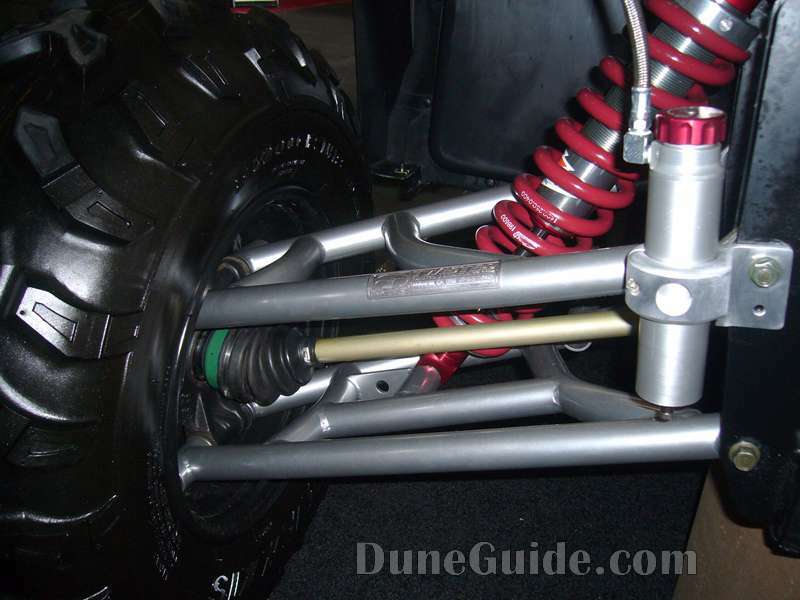 Axles - When you extend the wheels out, you are going to need new axles. 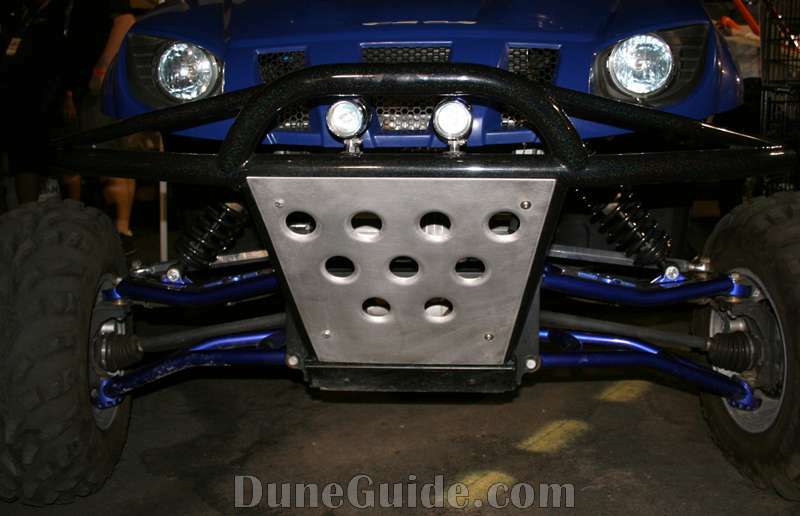 There are two approaches to this. 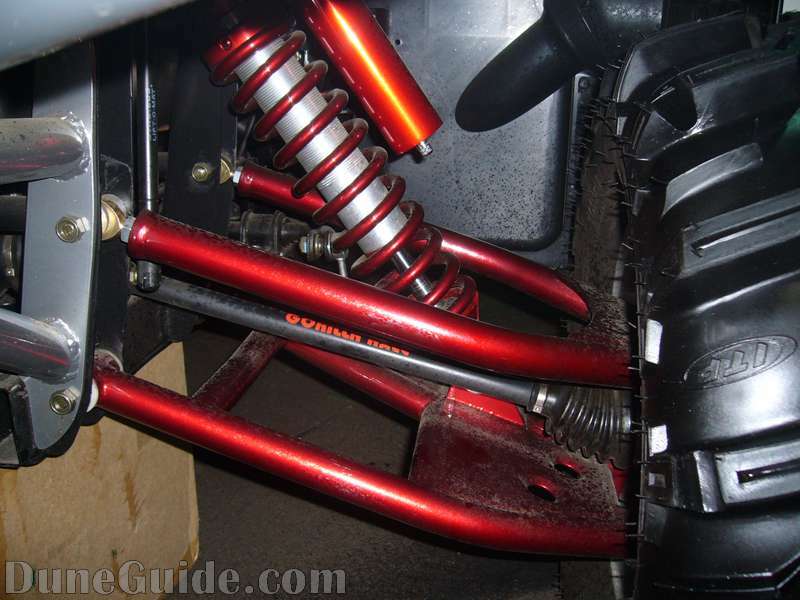 The cheaper route is to reuse the stock CVs and just replace the axles (for example - Gear One makes a 300m axle for Rhinos). 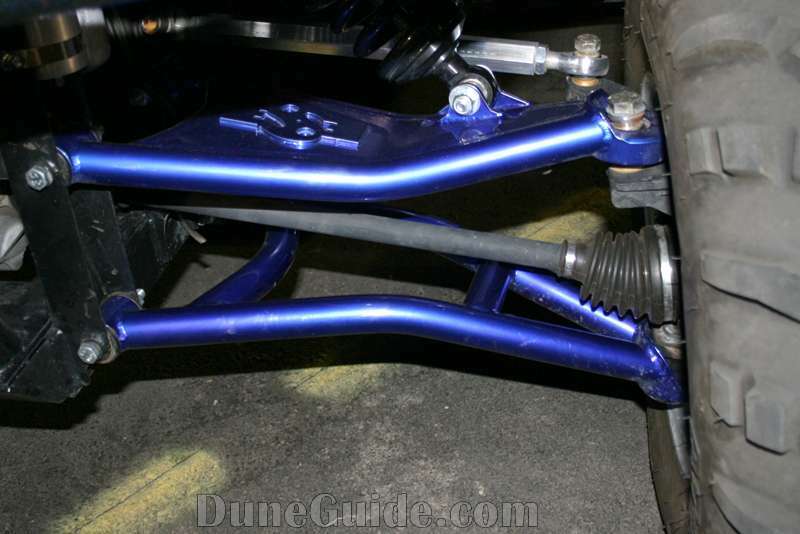 The more expensive route is new axles and CVs. 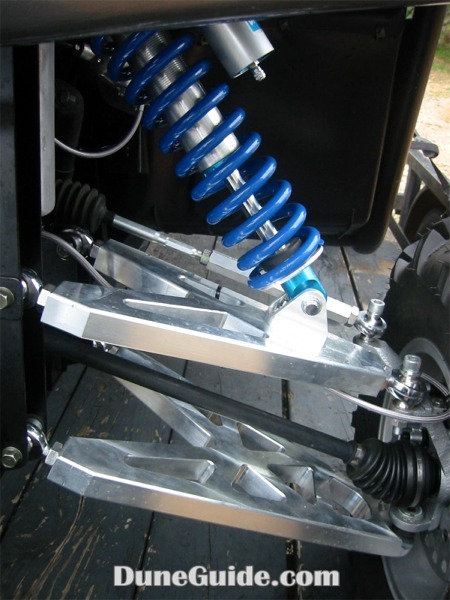 Many builders use Gorilla Axles & CVs. 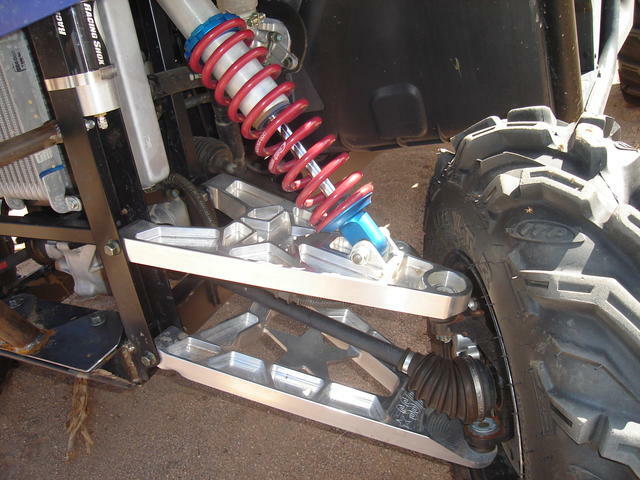 Stepping up to Gorilla Axles & CVs will increase strength and is much easier to install. 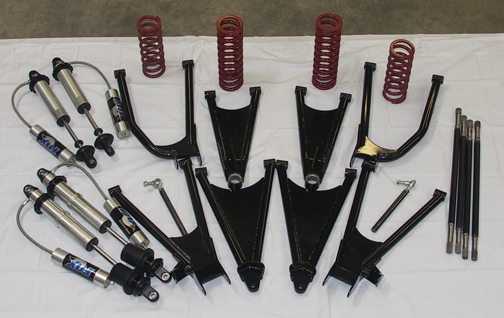 The cost to step up to Gorilla Axles and CVs varies, but expect to pay up to $1,500 more. 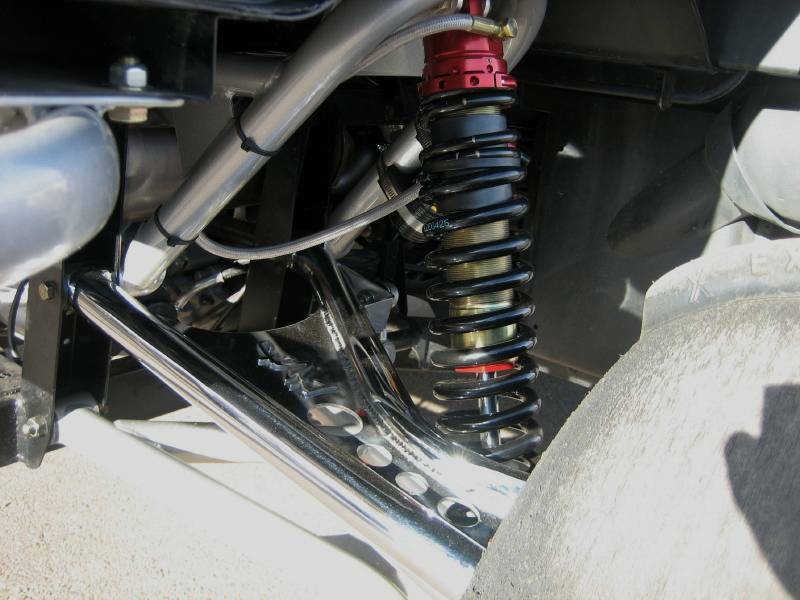 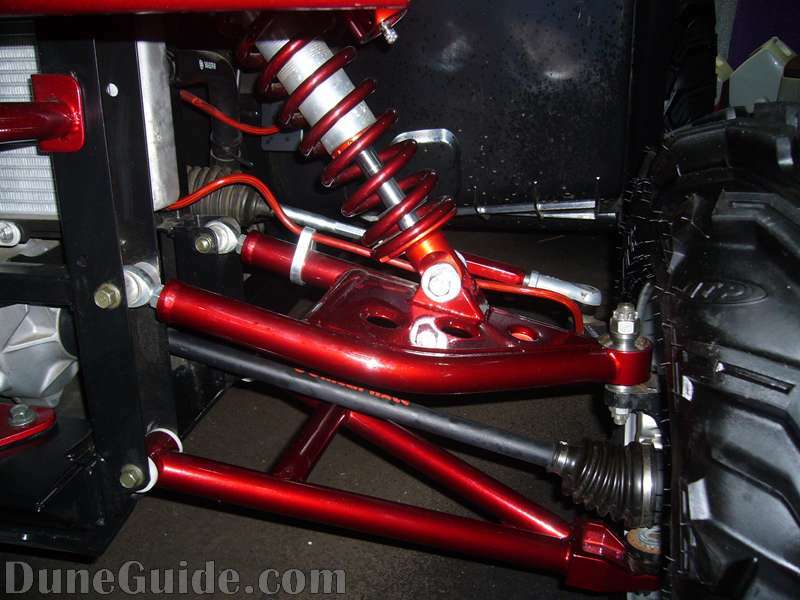 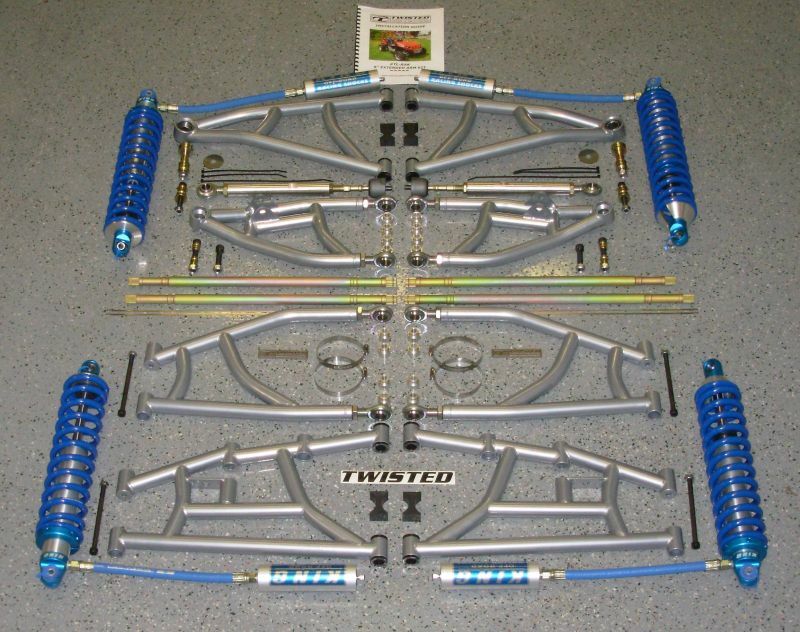 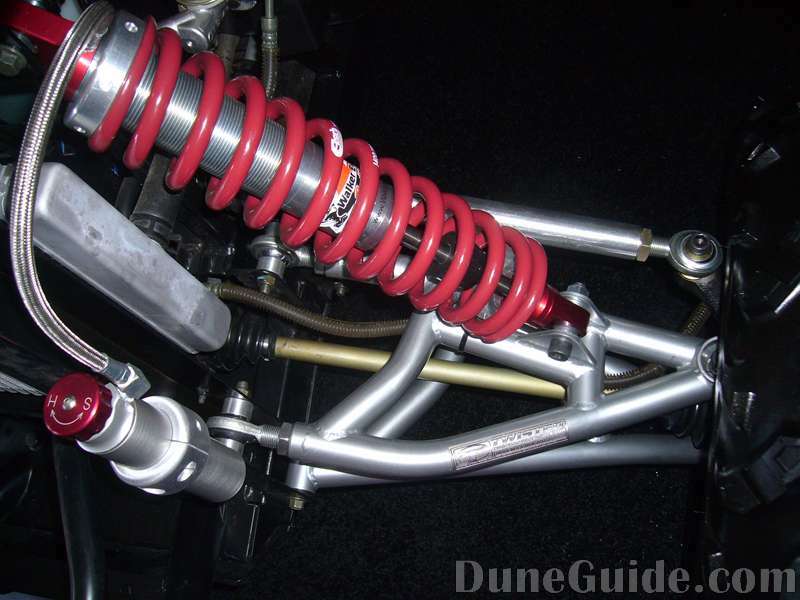 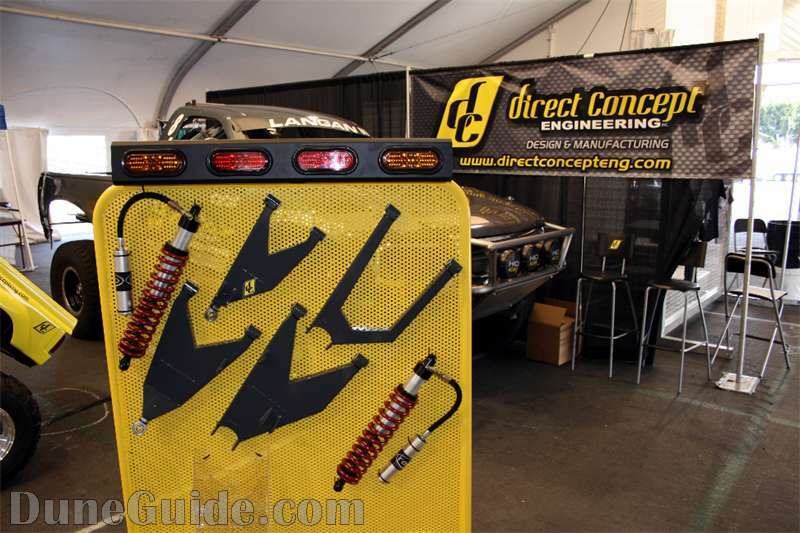 Shocks - All of the kits include new coilover shocks. 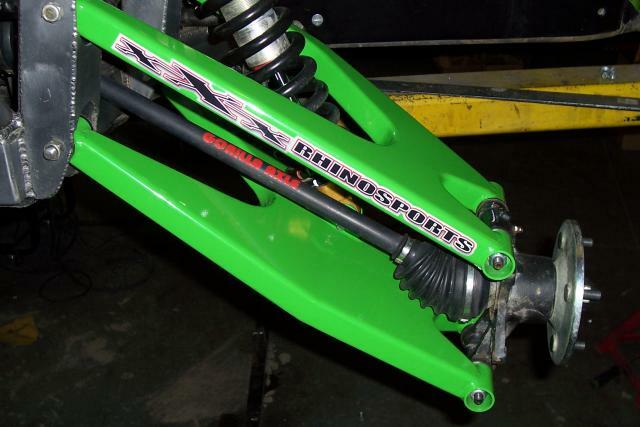 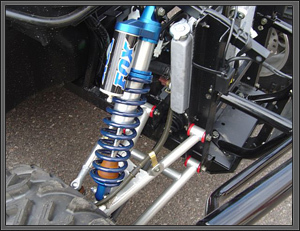 Several shock manufacturers have developed Rhino specific shocks, so there are many options and prices out there. 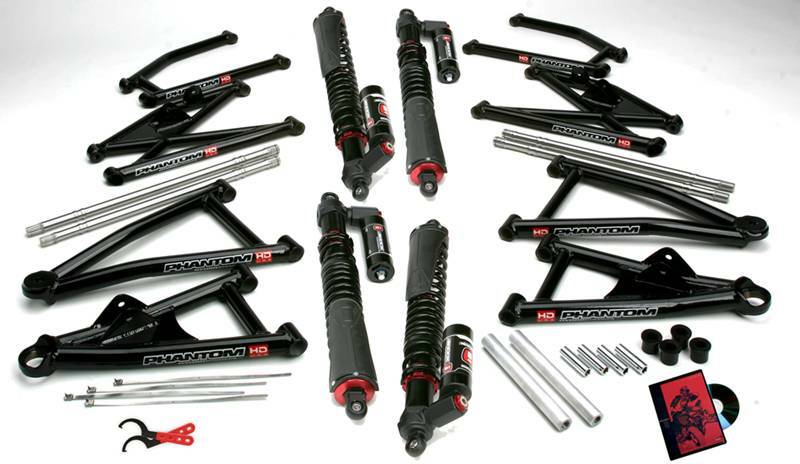 Long travel kit manufacturers will tend to have a favorite. 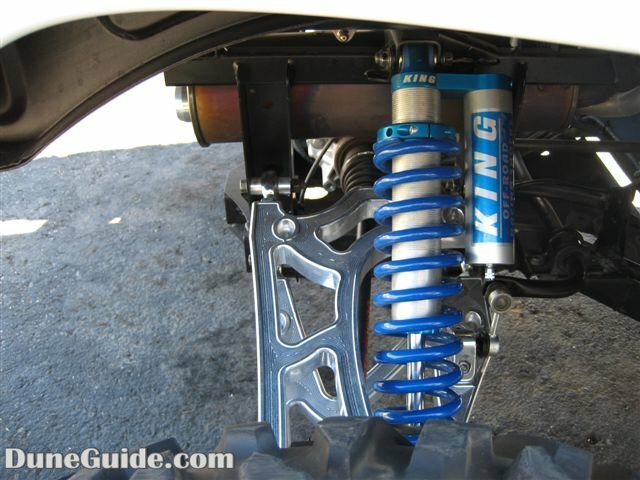 If you don't want to mess around with shock valving, stick with what the manufacturer recommends. 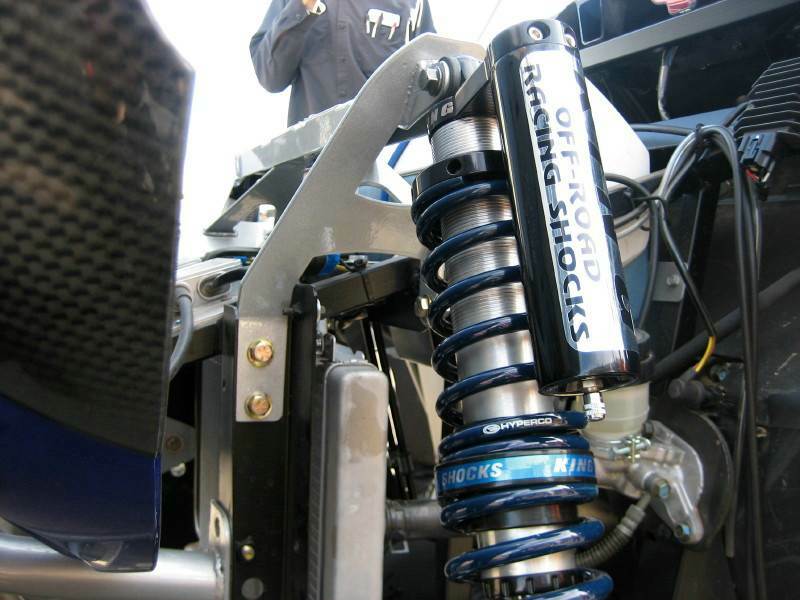 Shock selection can greatly affect not only the cost, but also the performance of the kit. 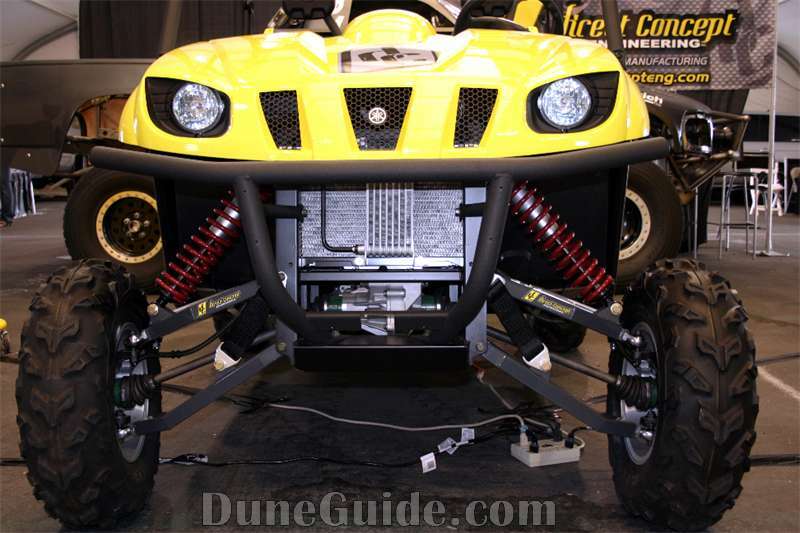 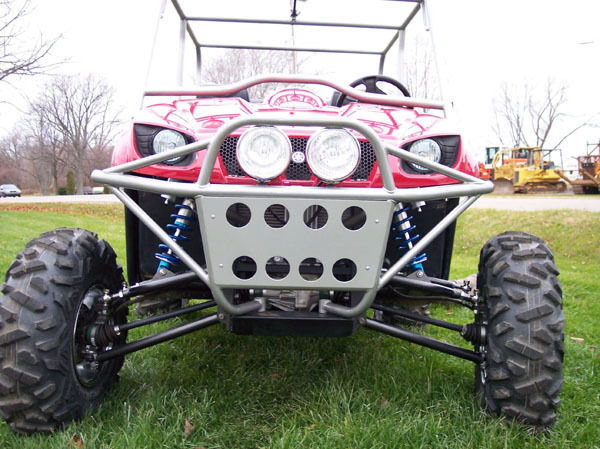 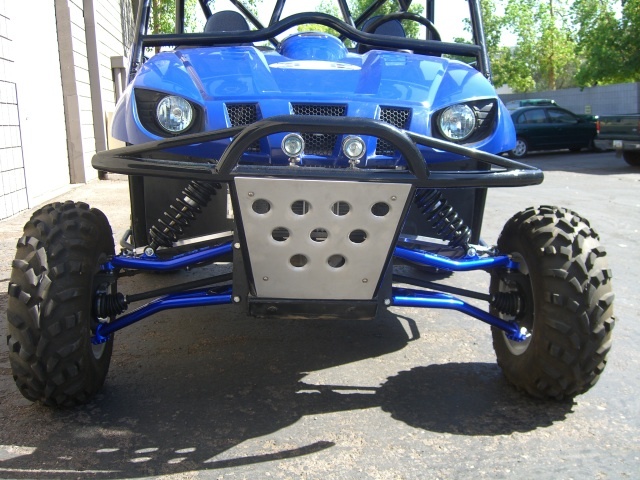 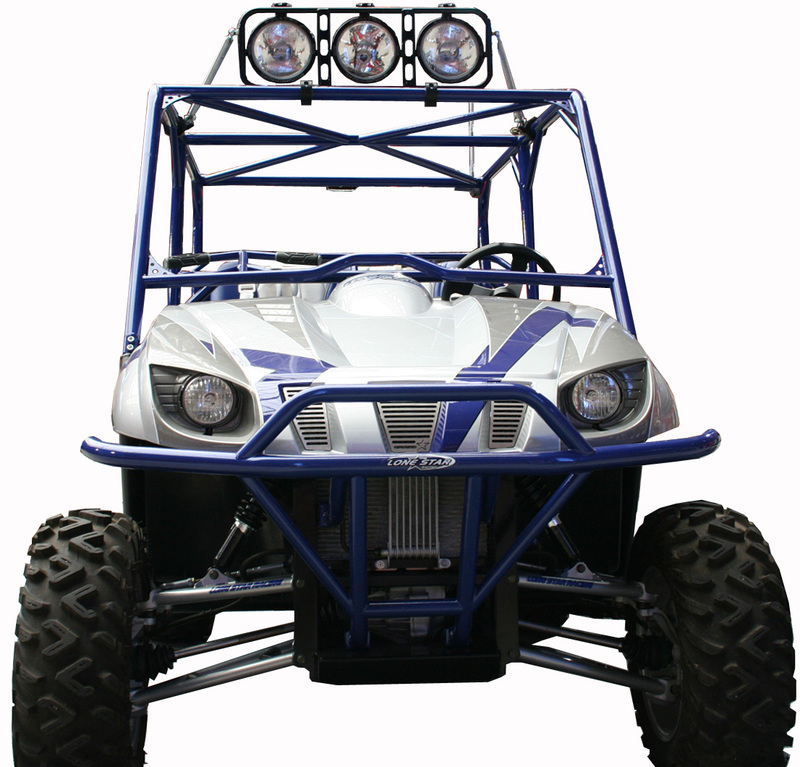 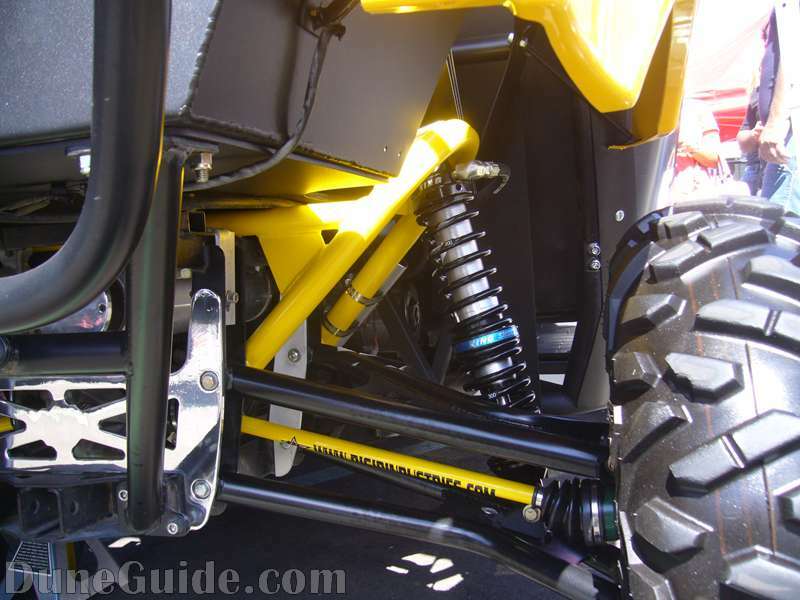 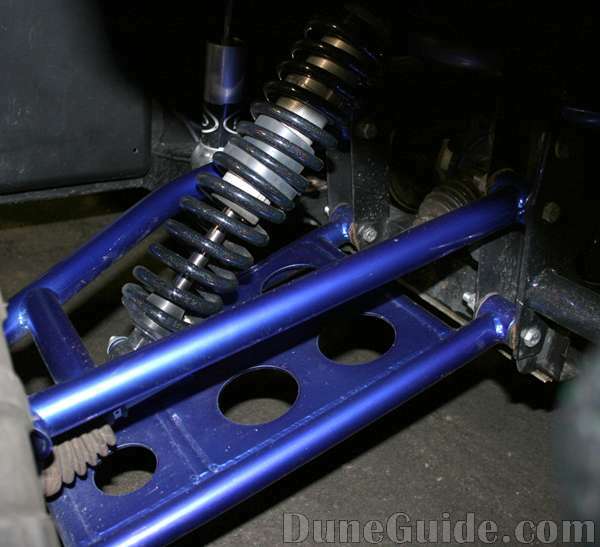 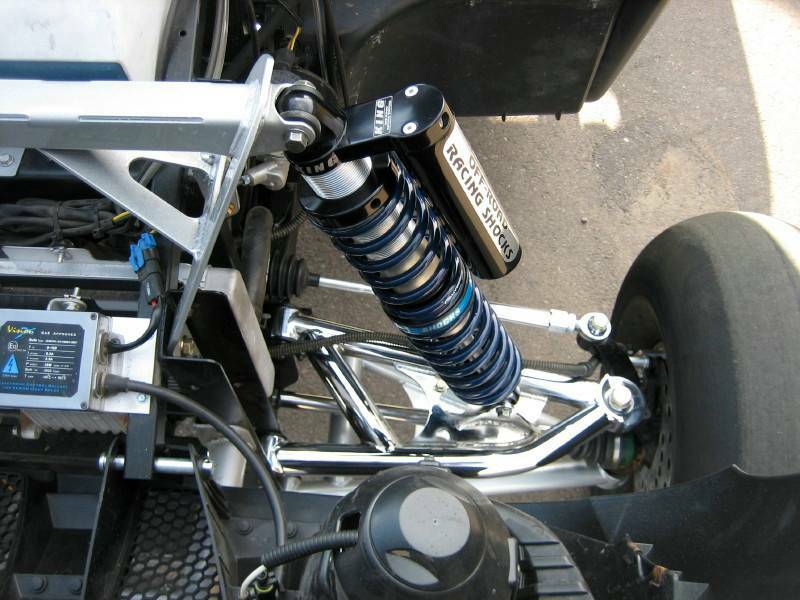 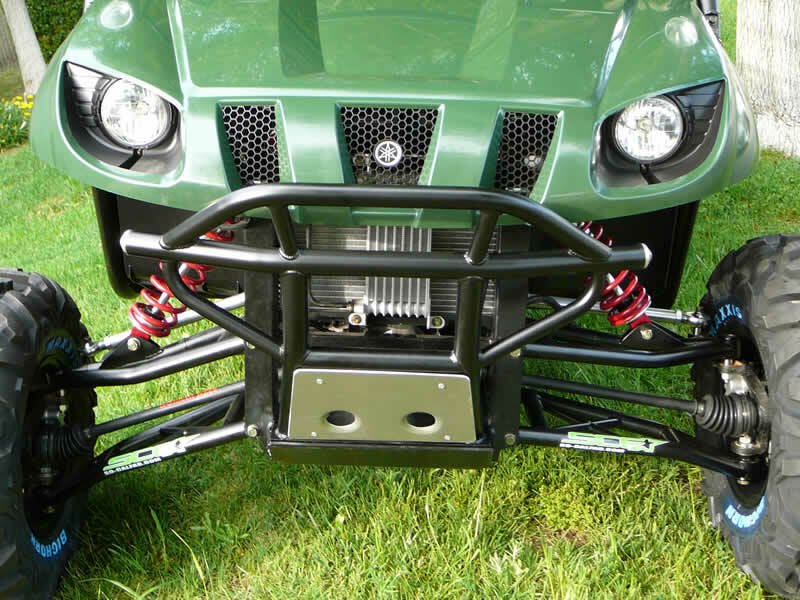 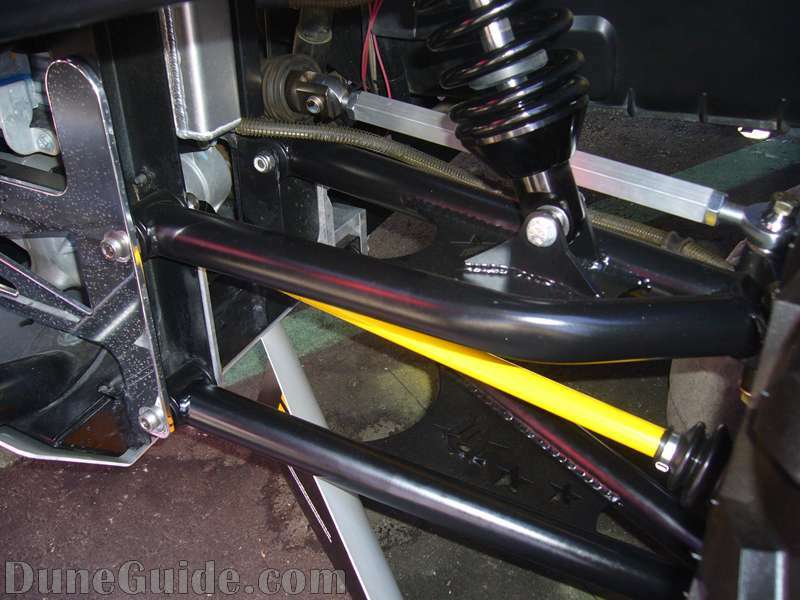 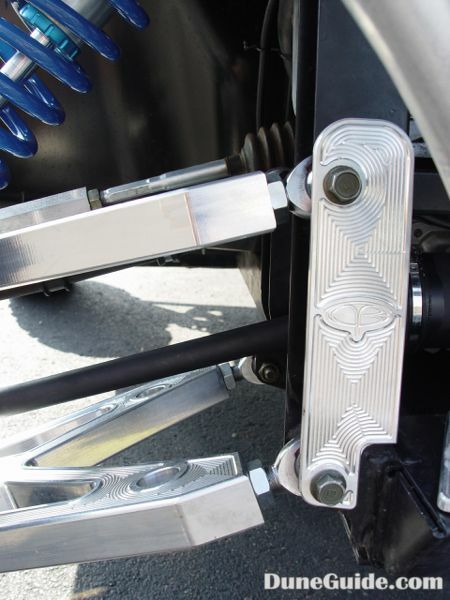 Front Shock Tower - A few of the kits have optional front shock towers that raises the upper shock mount location and allows for a longer shock and more wheel travel. 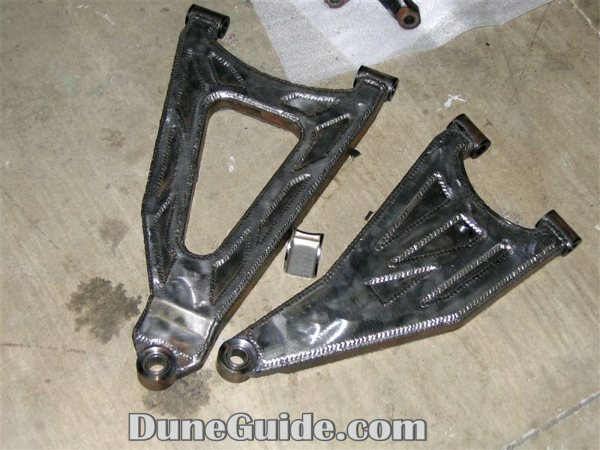 Some welding may be necessary. 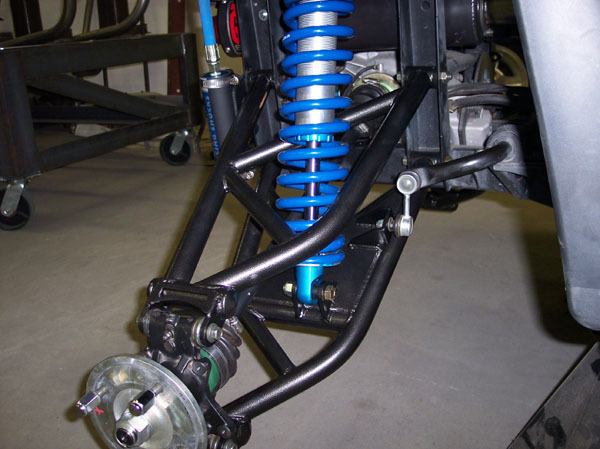 Does the kit affect ride height? 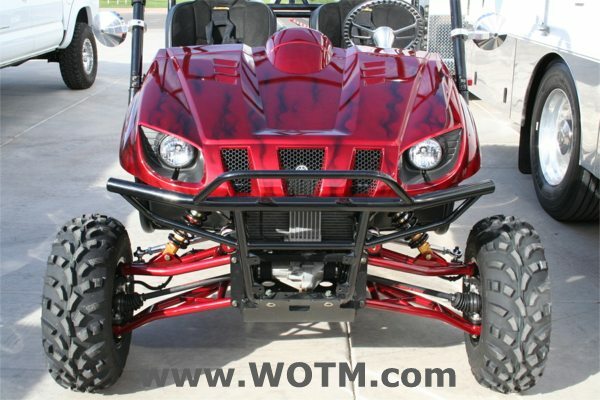 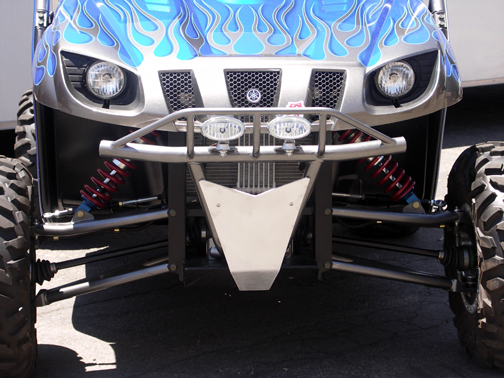 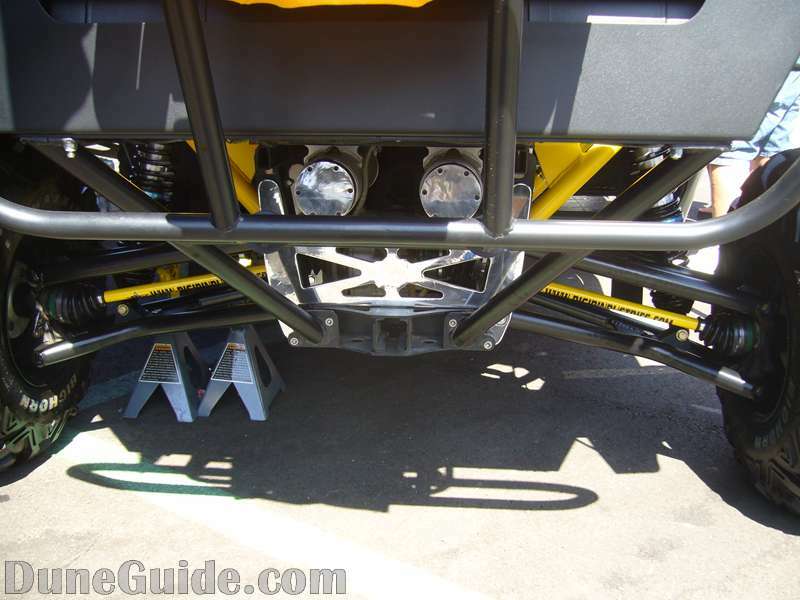 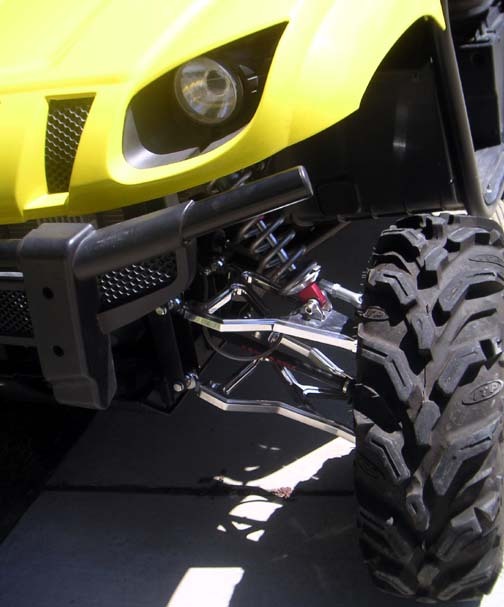 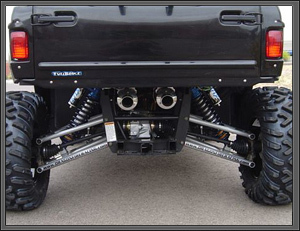 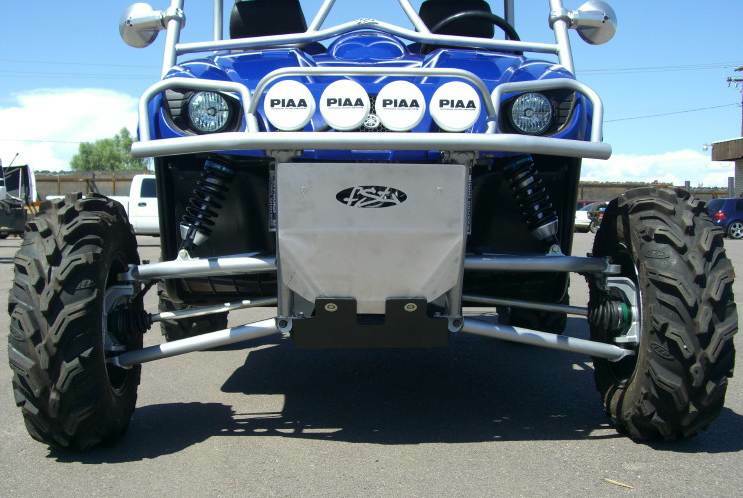 This not only affects how the Rhino will handle, but also if it will make it inside your toy hauler. 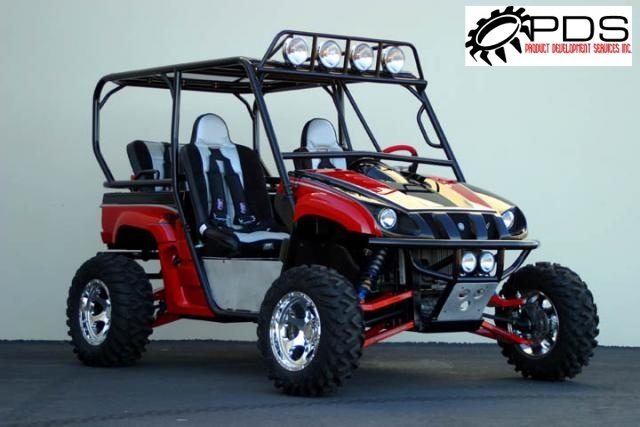 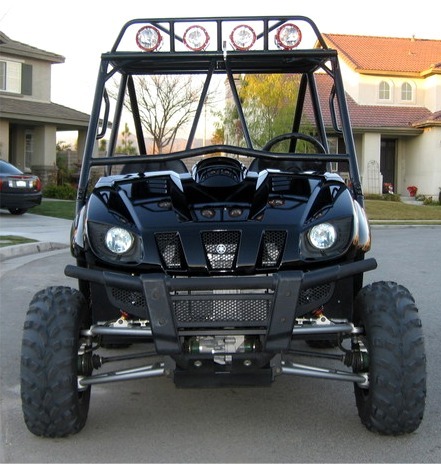 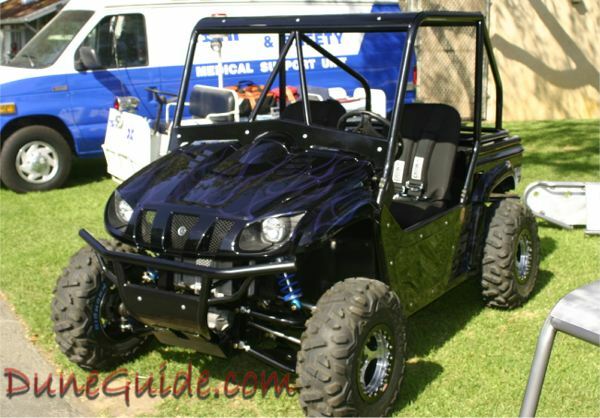 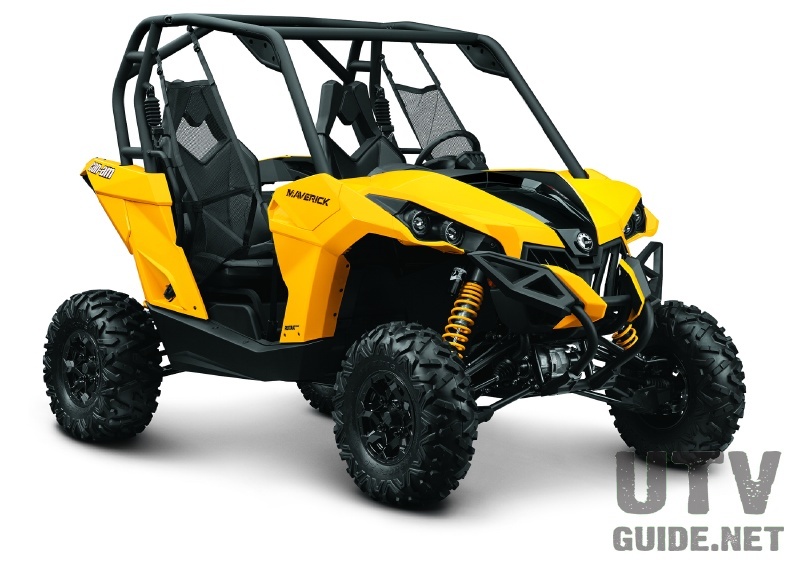 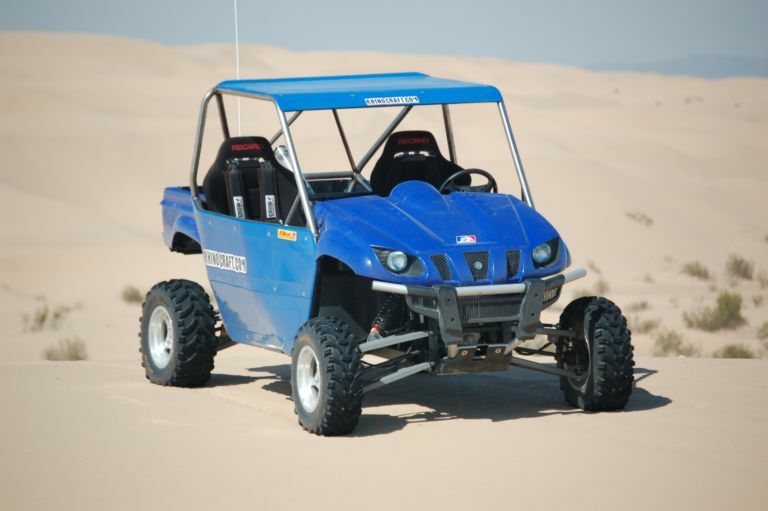 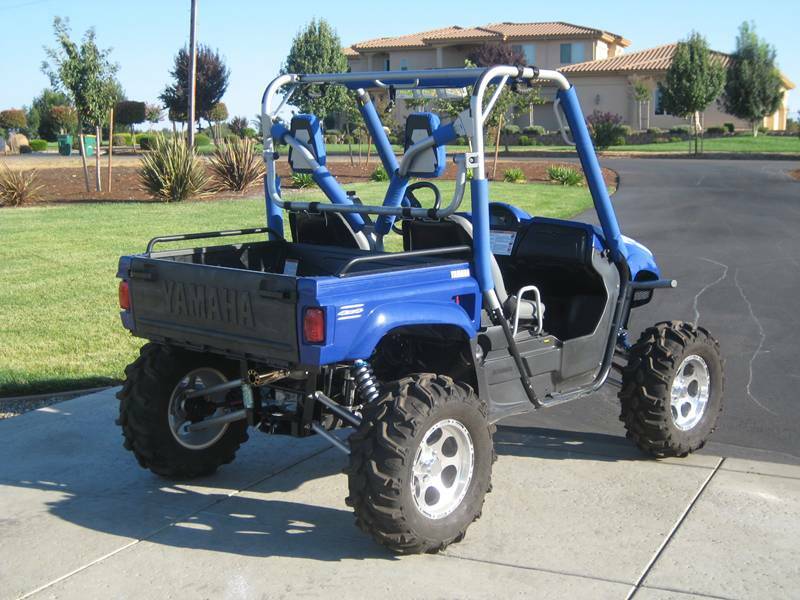 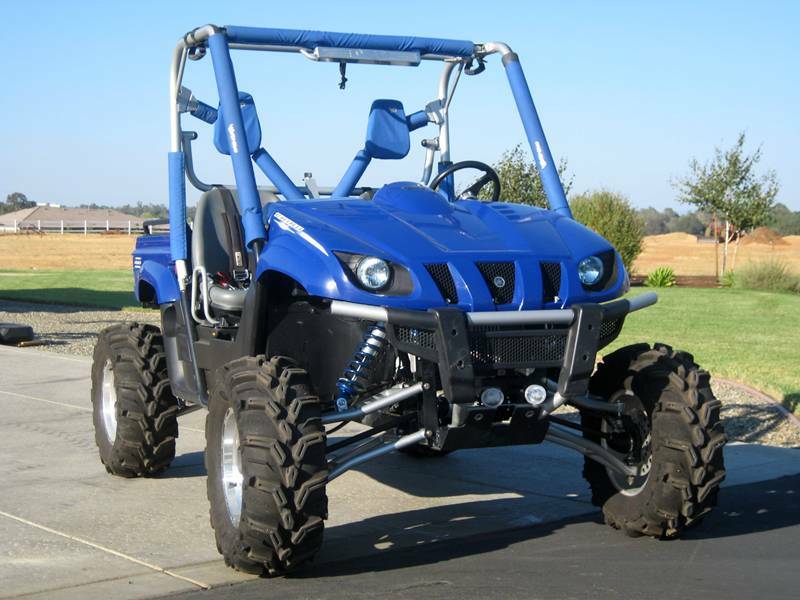 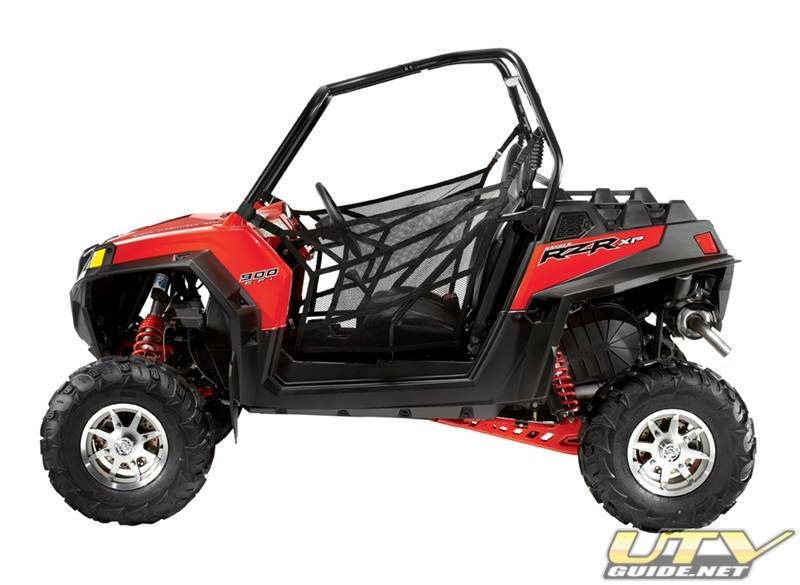 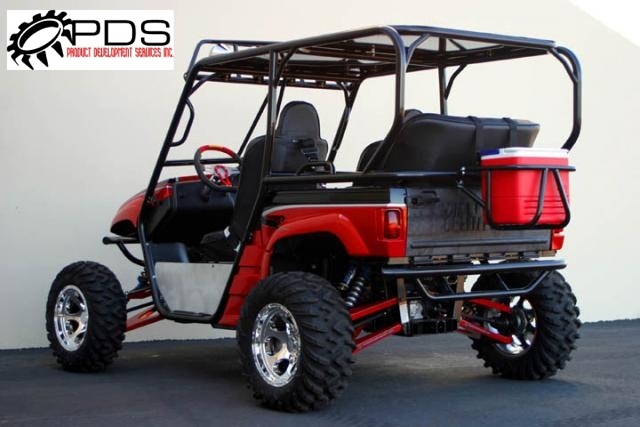 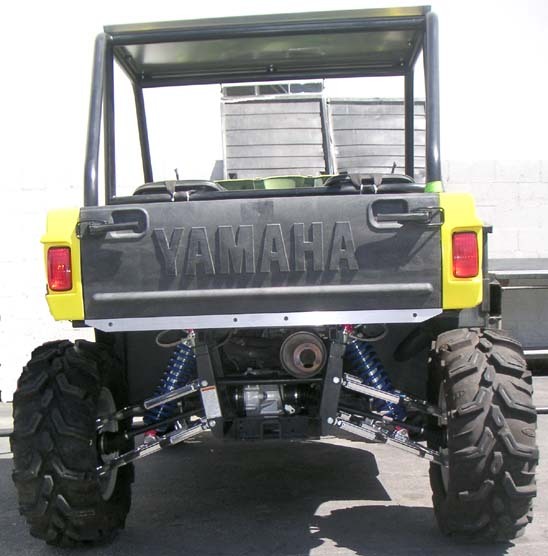 If you manufacture or sell parts and accessories for Yamaha Rhino's, and are interested in having your product be part of the Rhino Buildup, please send us an email. 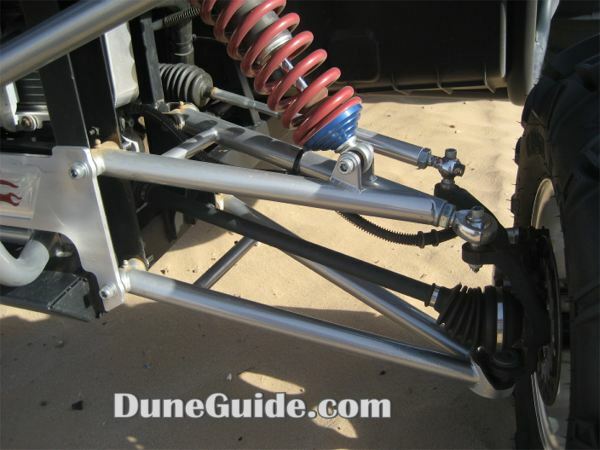 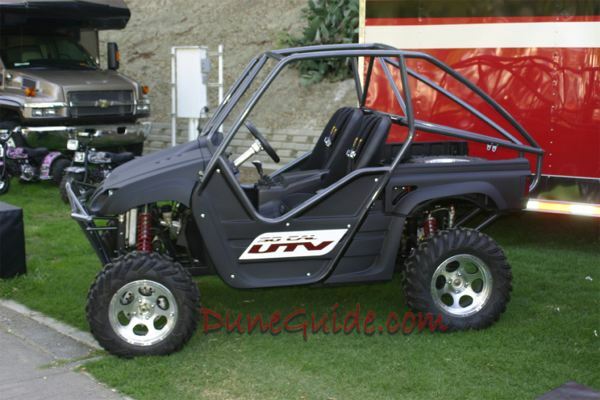 A link back to DuneGuide.com from your website is appreciated. 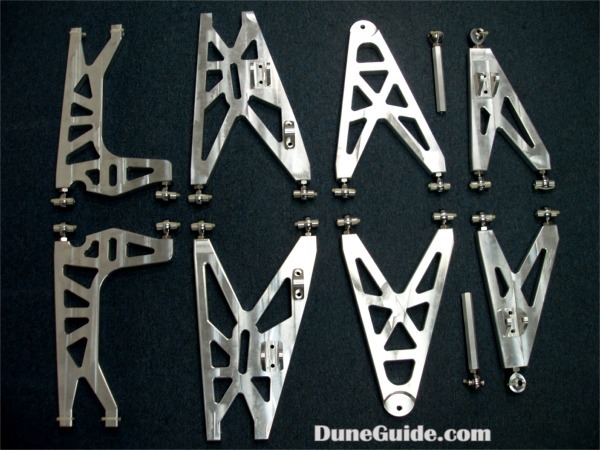 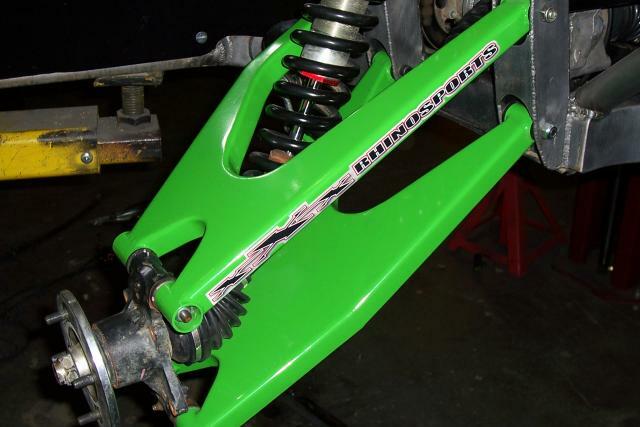 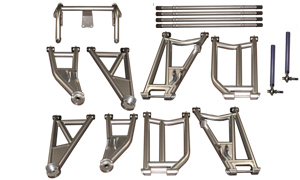 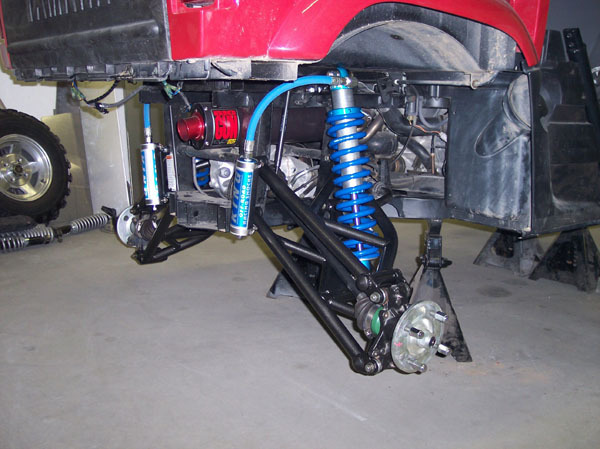 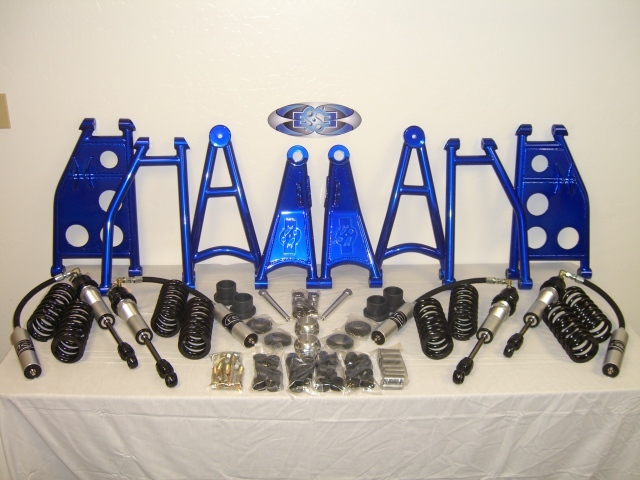 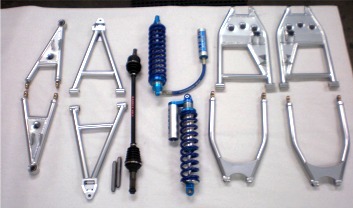 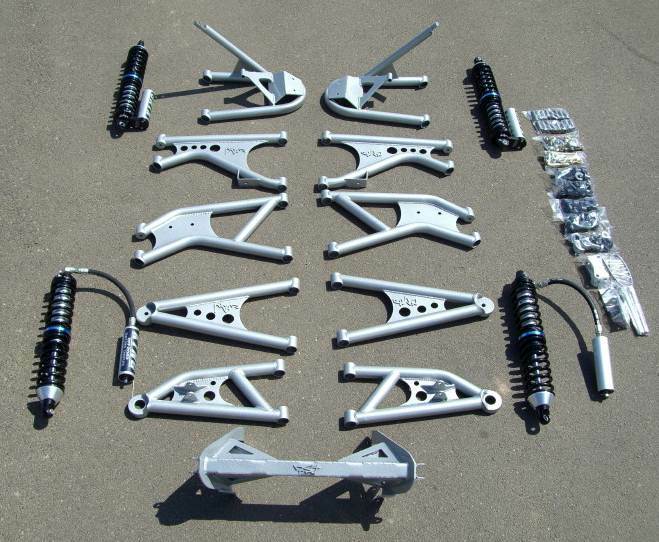 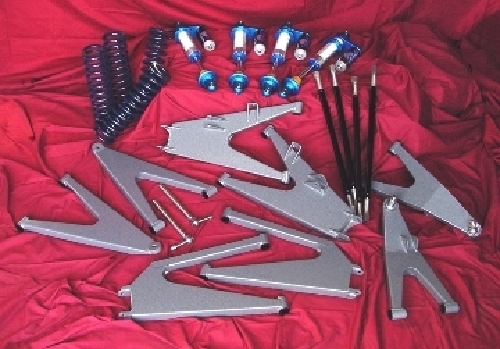 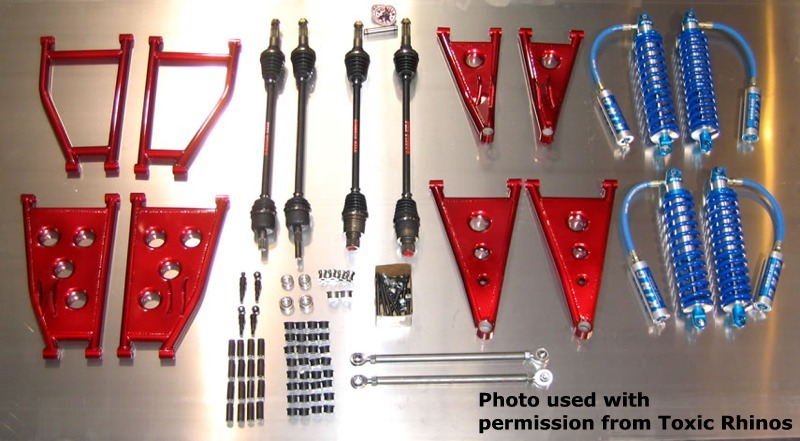 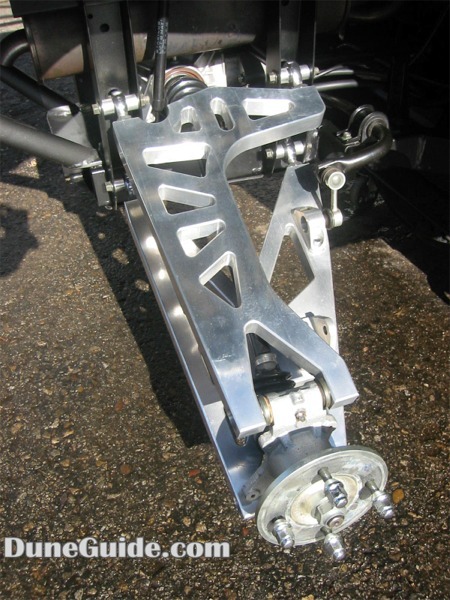 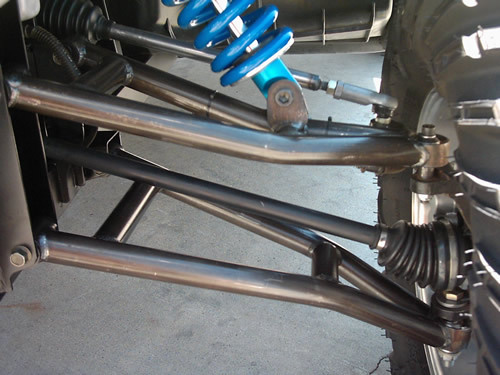 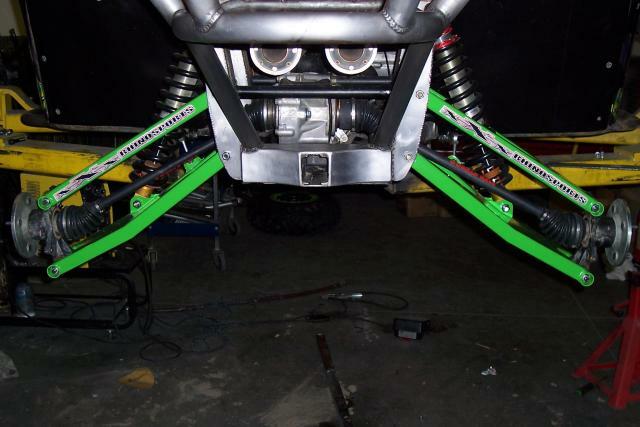 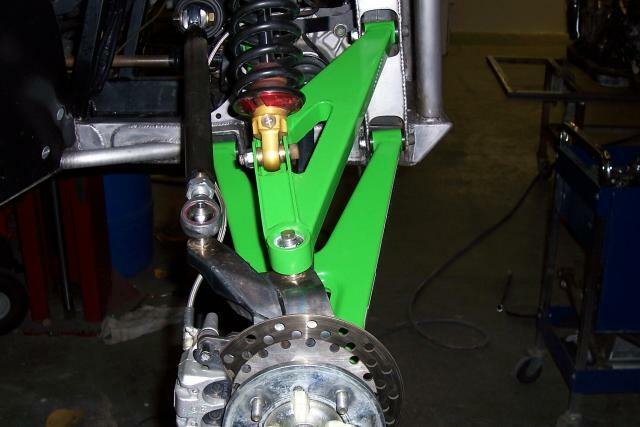 Also manufacture Control Arm Frame Gussets and Rear Differential Support Kits. 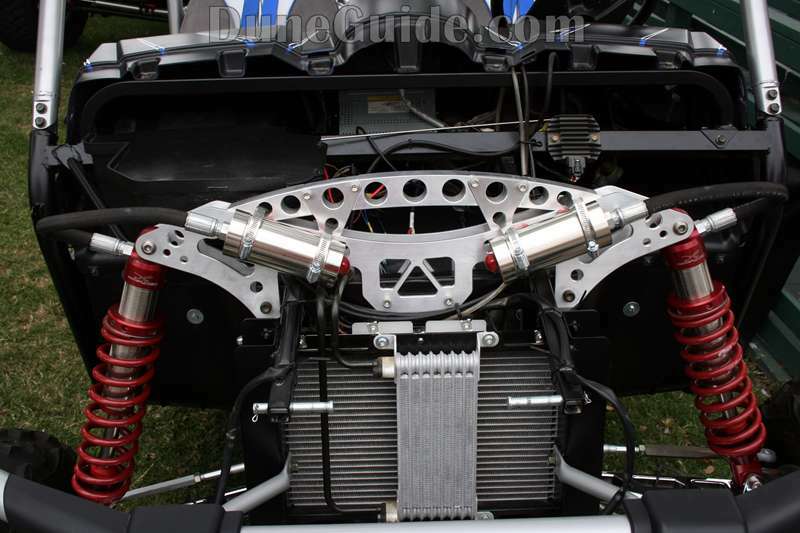 A-Arm width: +6” wider per side. 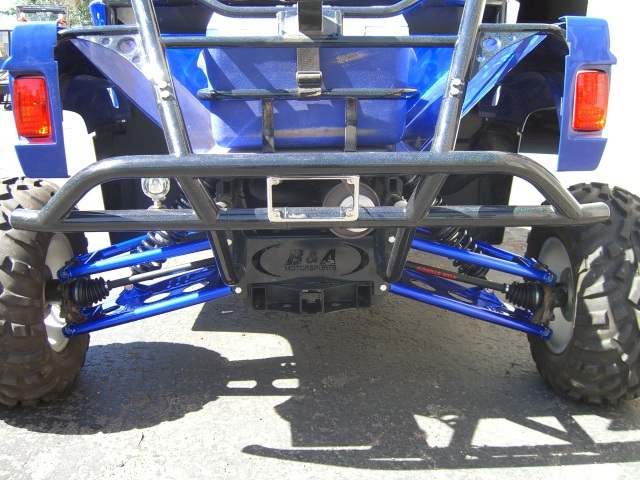 A-Arm width: +3.5" wider per side. 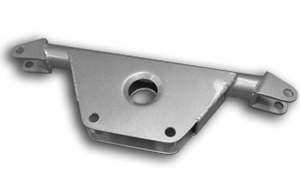 A-Arm width: +6.5” wider per side. 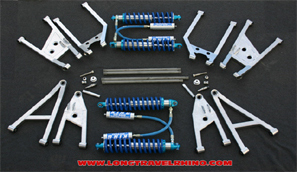 Billet aluminum long travel kit. 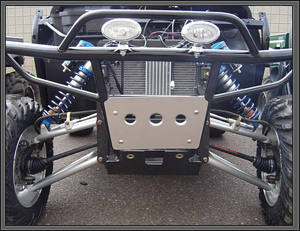 A-Arm width: +6" wider per side. 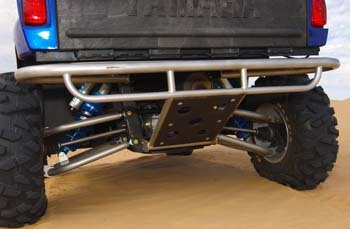 Wheelbase: 2” forward, and 2” rear. 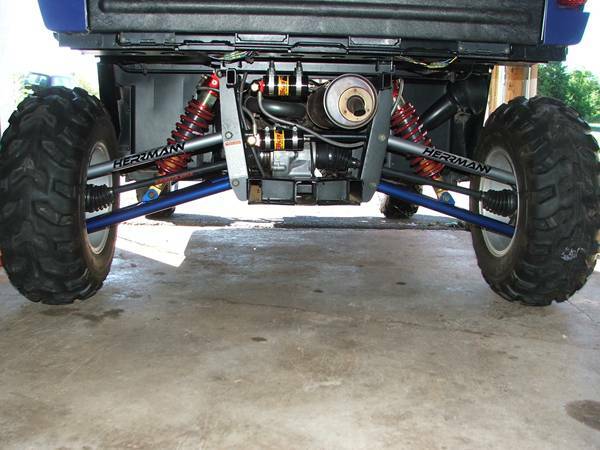 Wheel Travel: 15.5” of rear, 14.25” front. 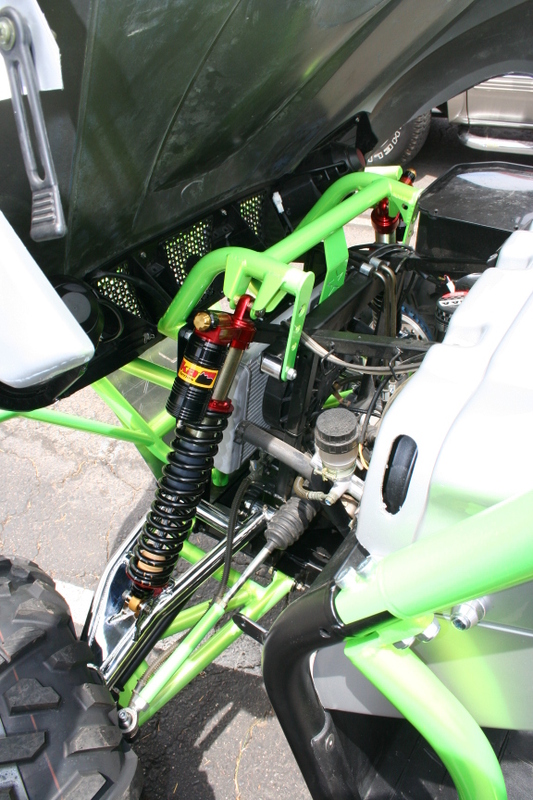 A-Arm width: +3" wider per side. 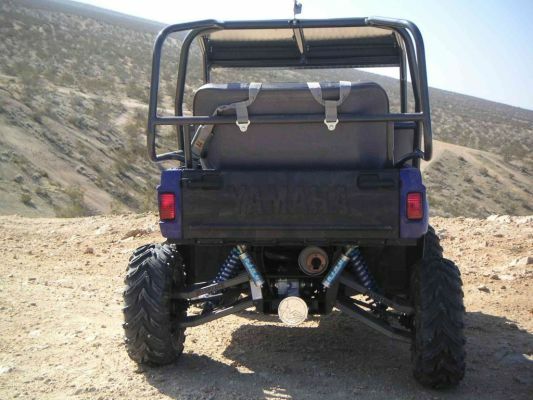 Wheelbase: 1" forward and 1" backward. 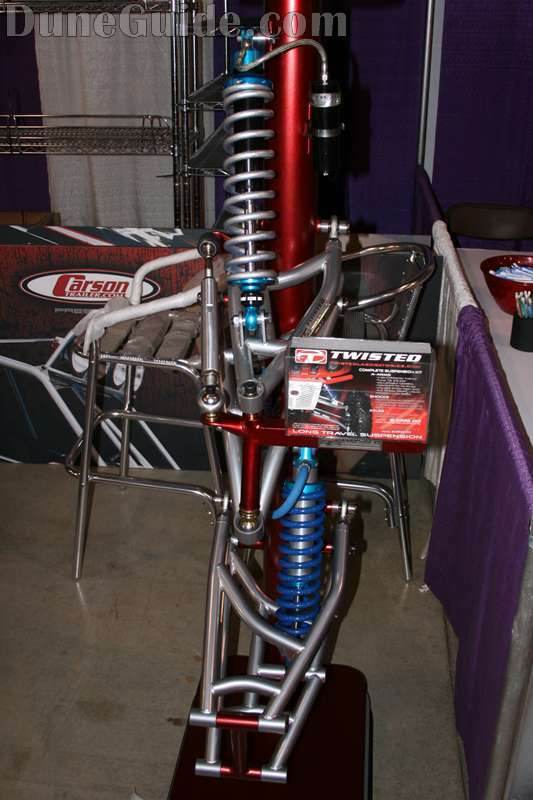 A-Arm width: + 5” wider per side. 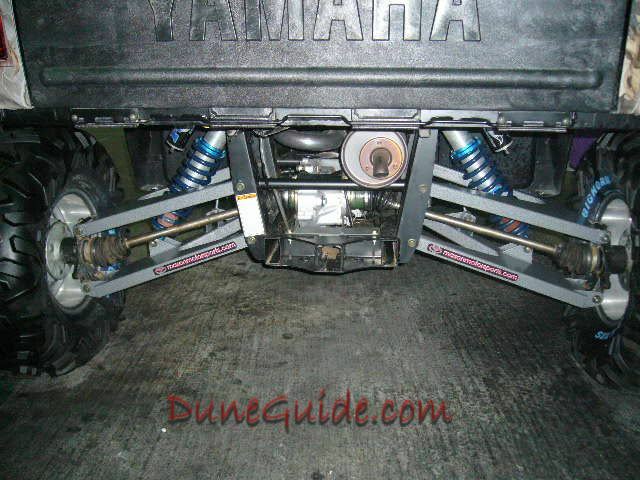 Wheelbase: Forward 2” and back 2”. 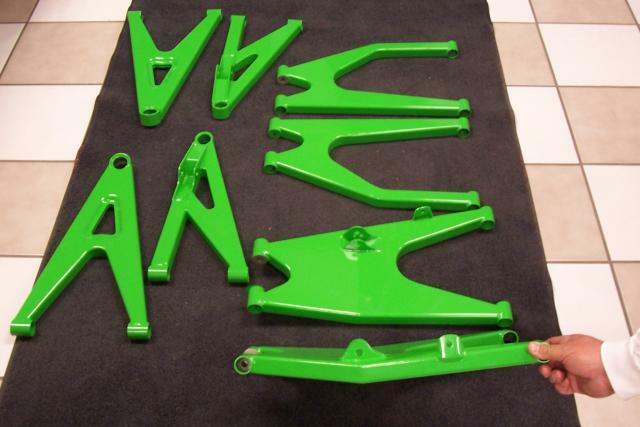 Fully boxed A-arms made of 4130 chromoly. 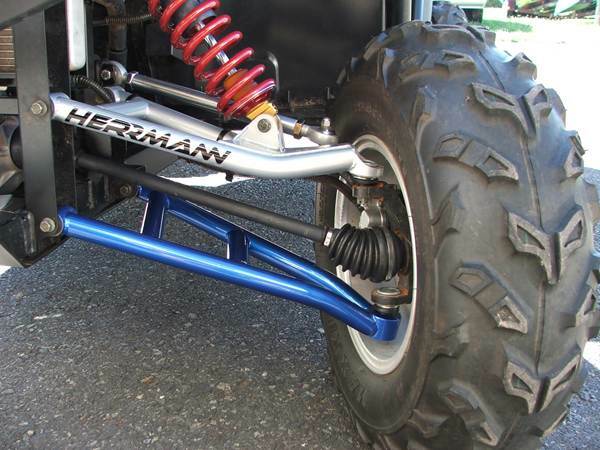 A-Arm width: + 6"wider per side. 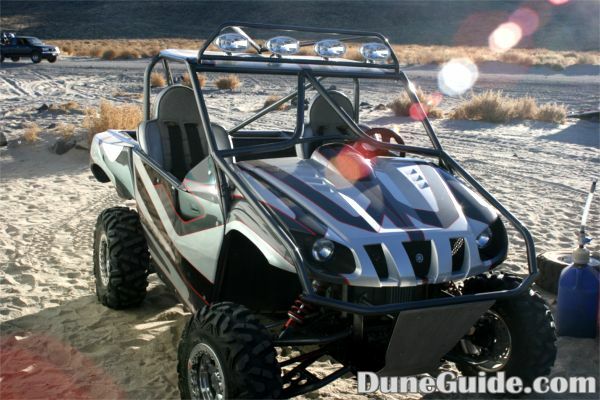 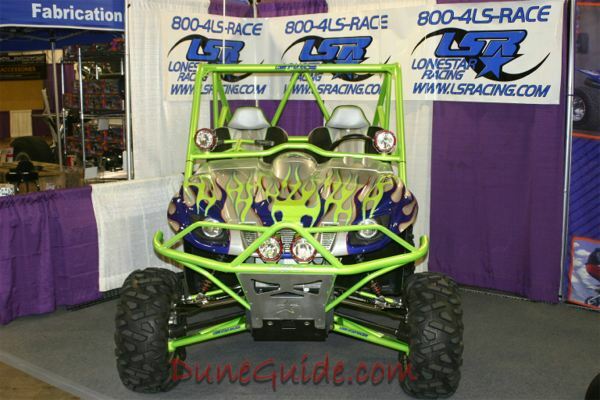 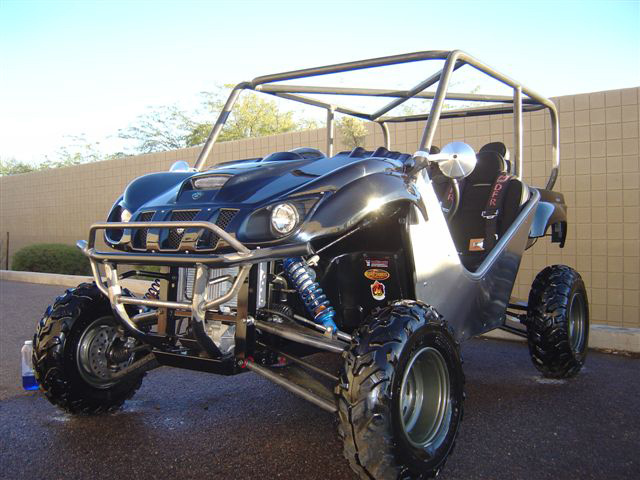 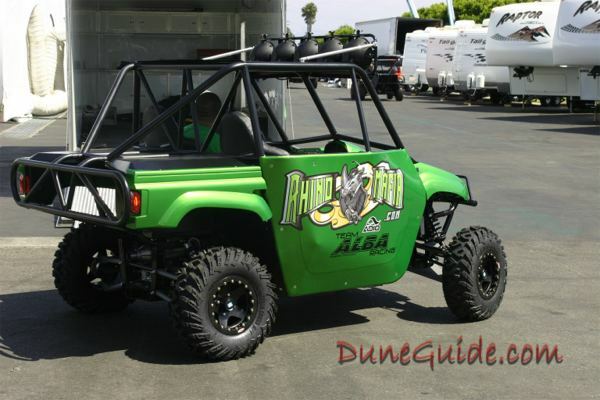 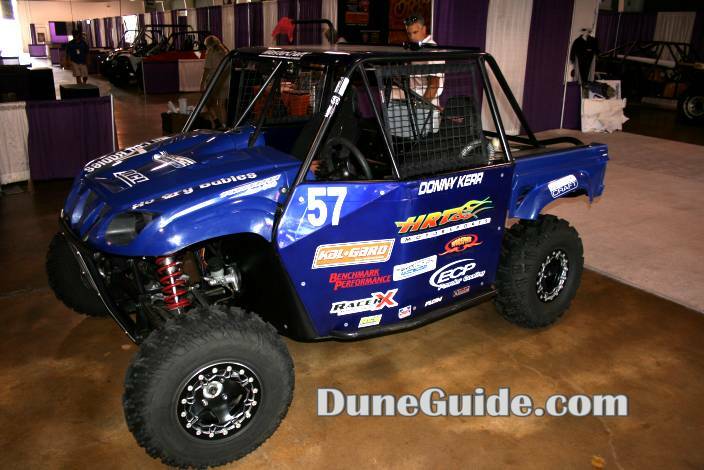 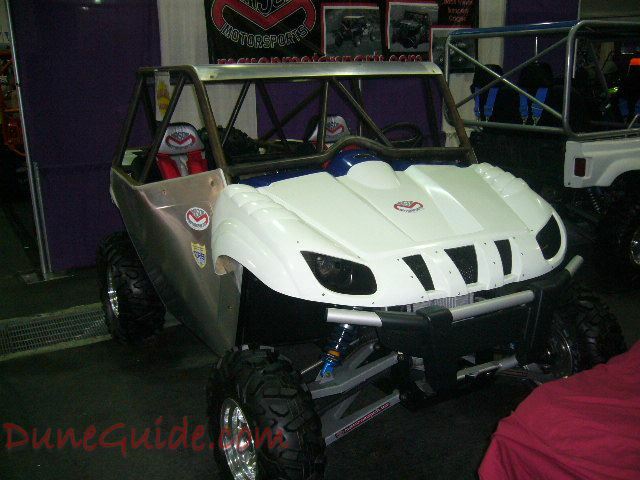 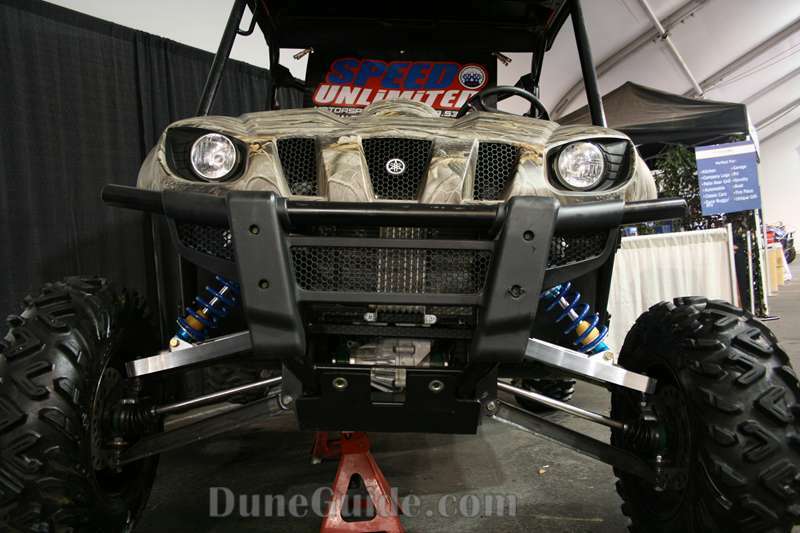 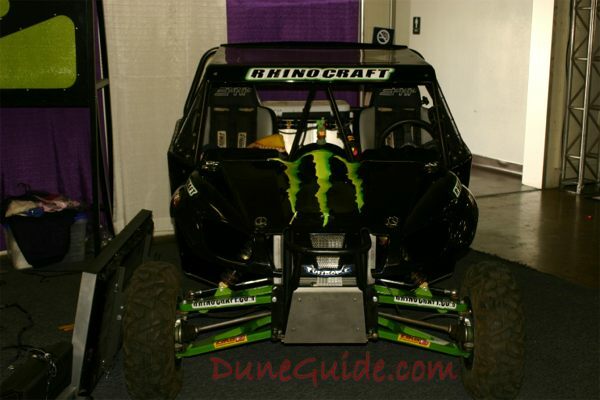 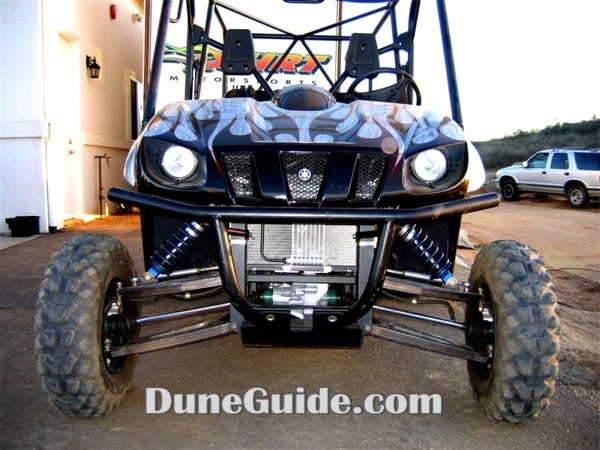 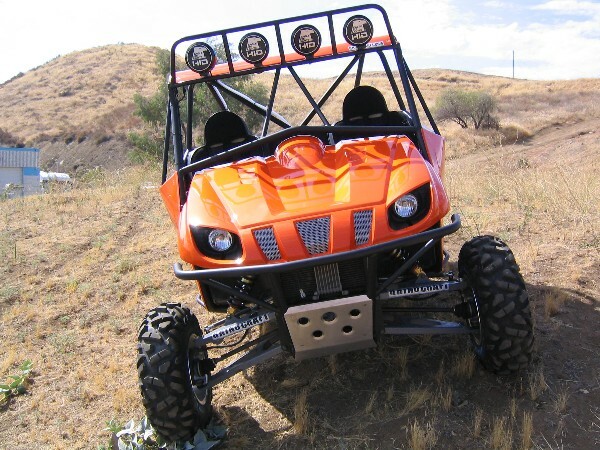 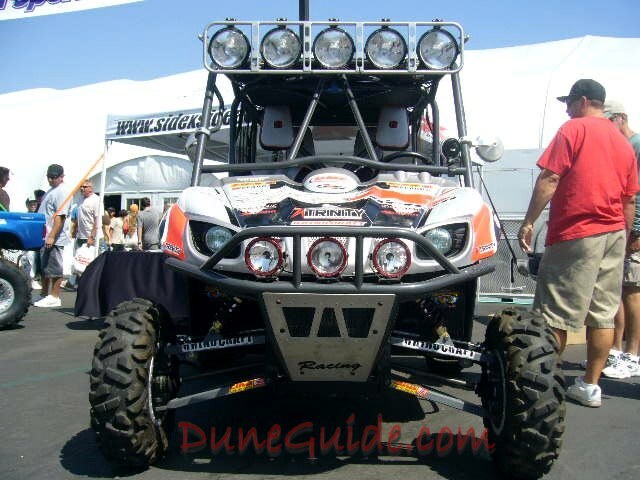 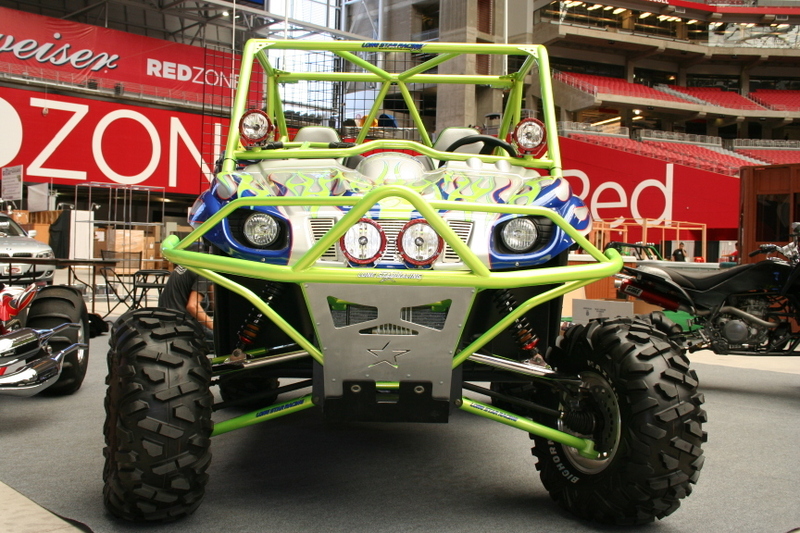 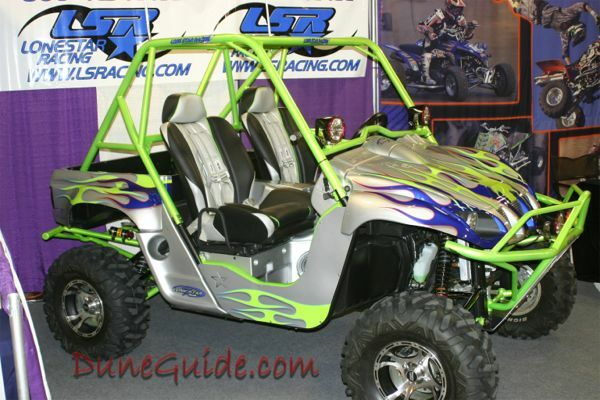 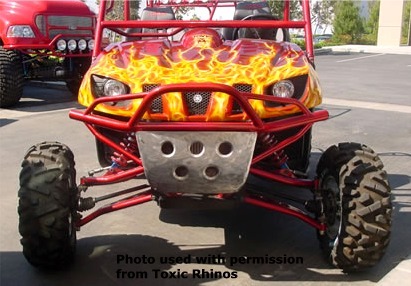 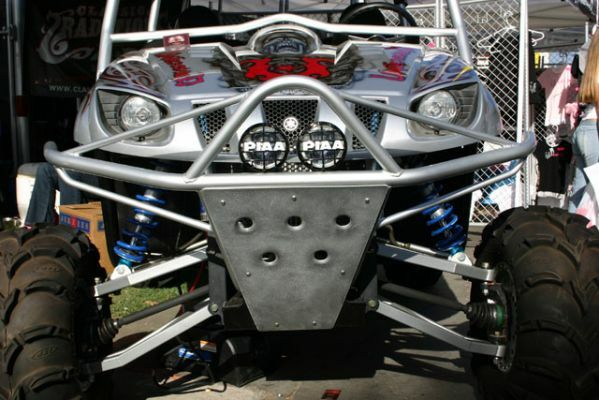 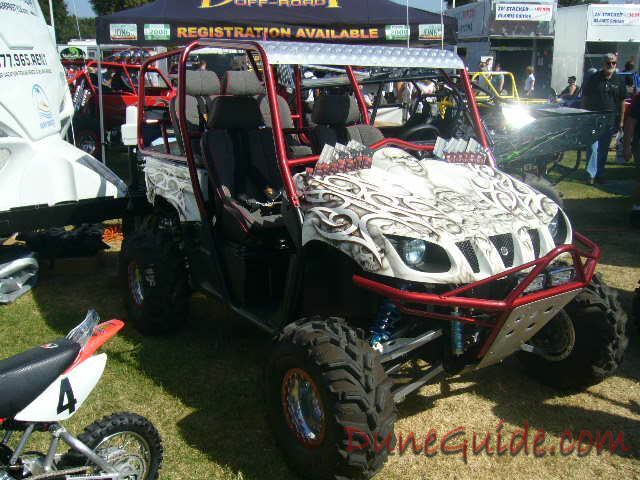 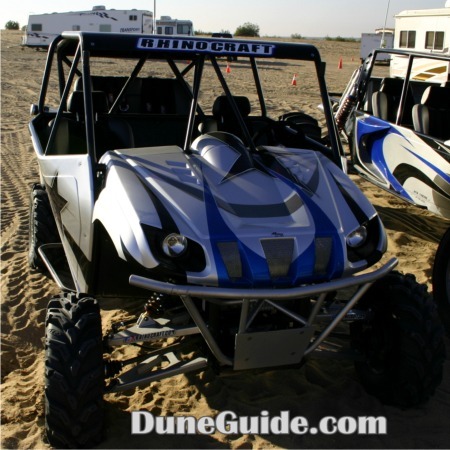 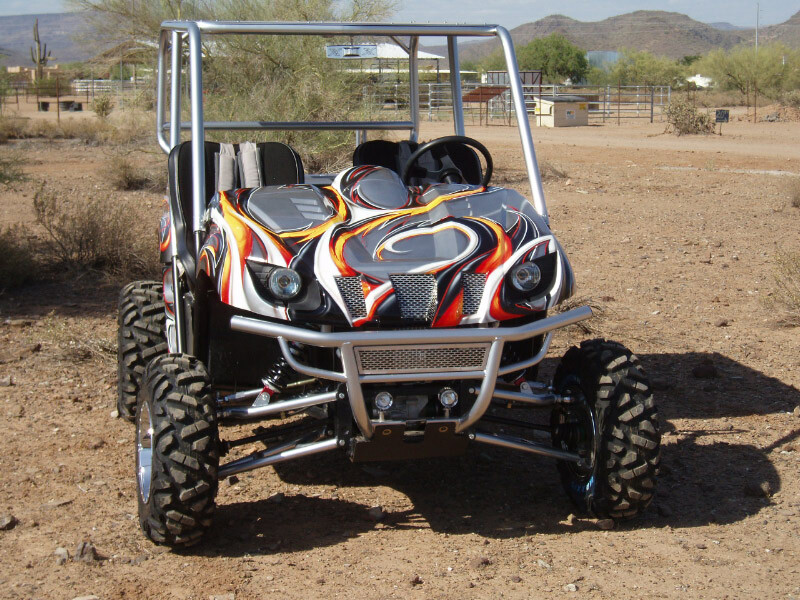 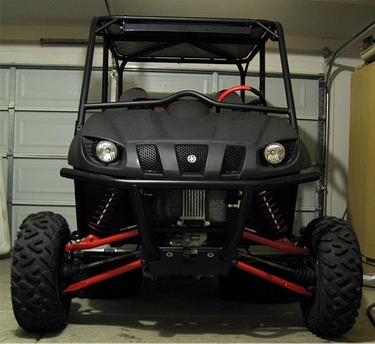 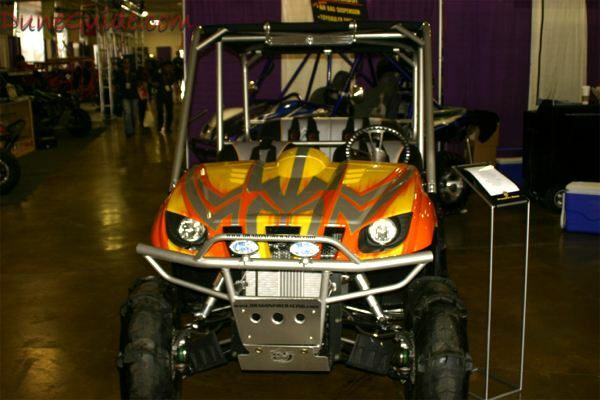 Videos - Mason Motorsports Rhino's in action. 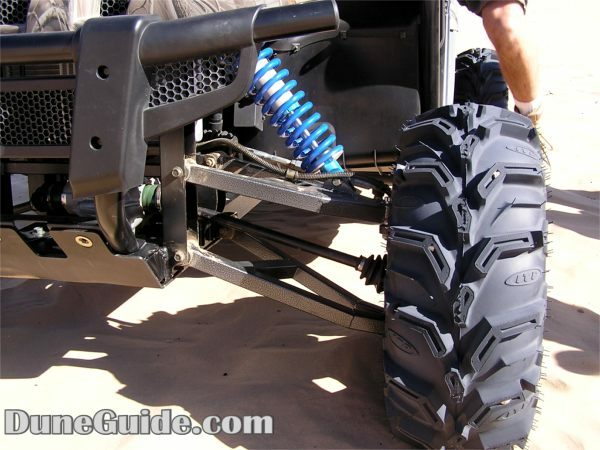 A-Arm width: +4" wider per side. 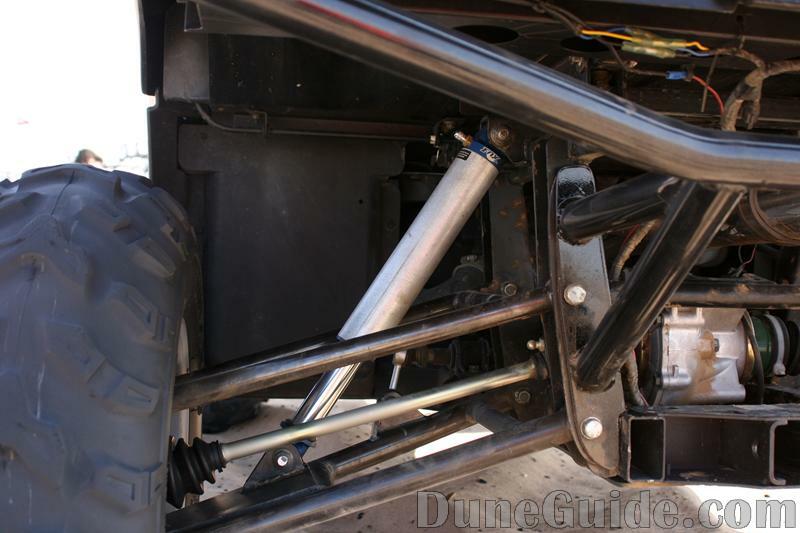 Wheel travel: 14" in front (with upper mount relocate kit), 16" rear. 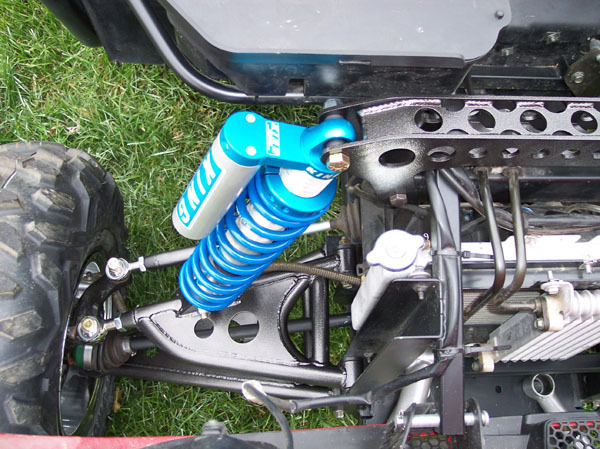 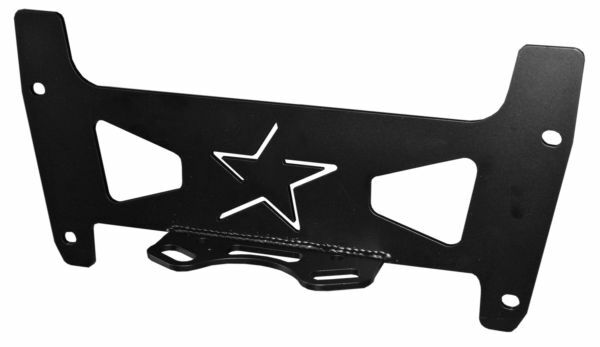 Front shock tower mount available. 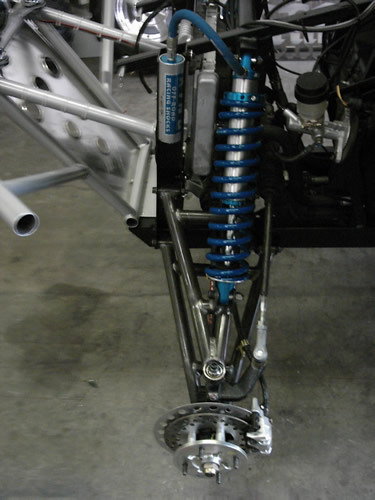 A-Arm width: +6.5" wider per side. 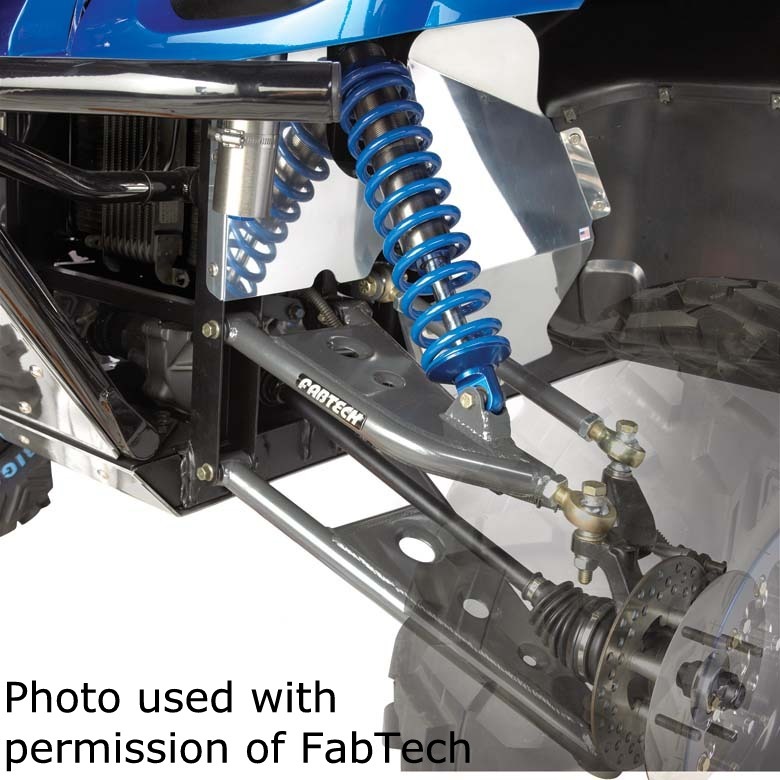 If you manufacture long travel suspension kits, axles or shocks for Yamaha Rhino's, and are not on this list, please send us an email with your company details. 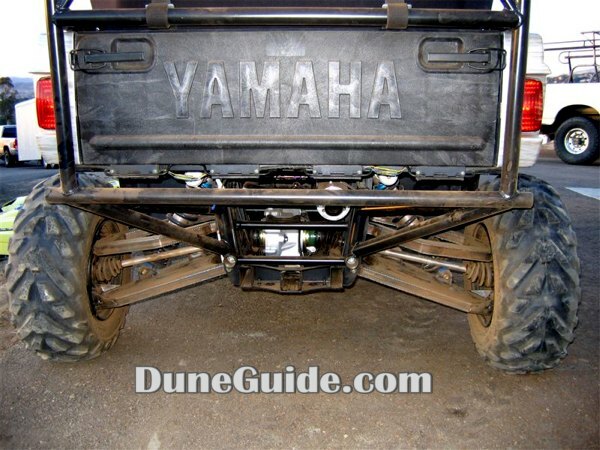 A link back to www.DuneGuide.com is always appreciated. 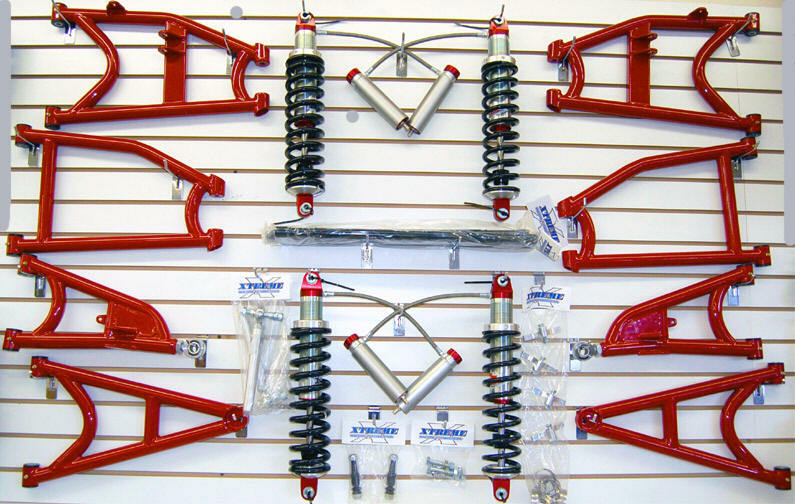 Dealers - Long Travel Kits, Shocks, Axles, etc. 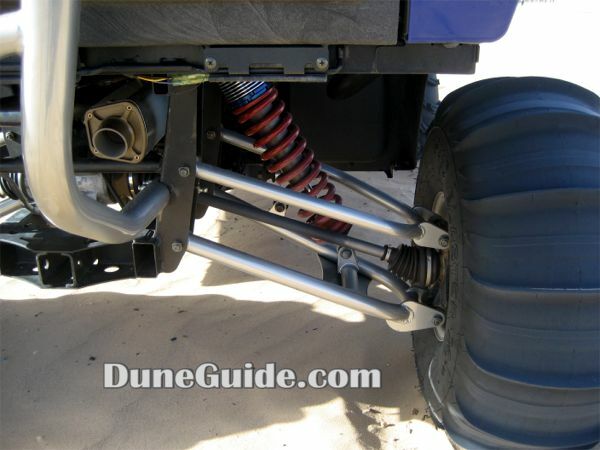 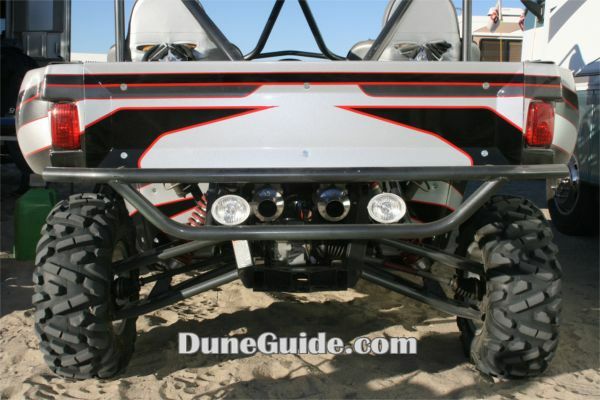 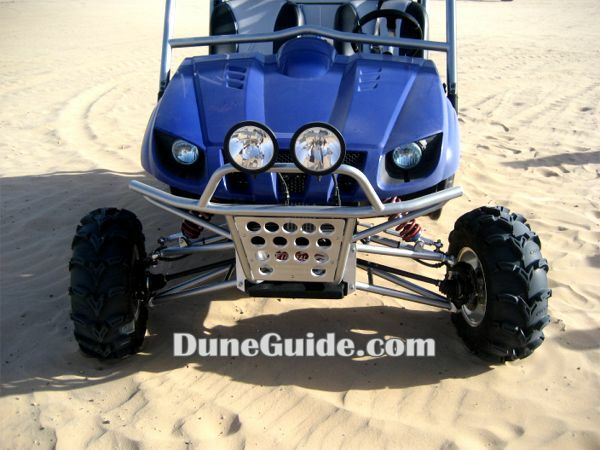 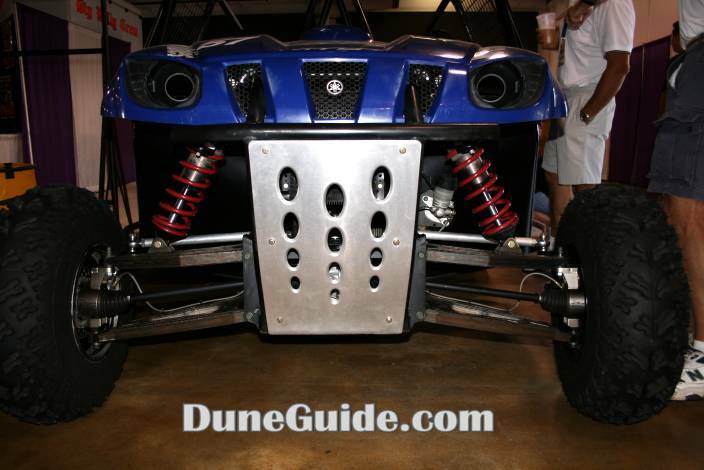 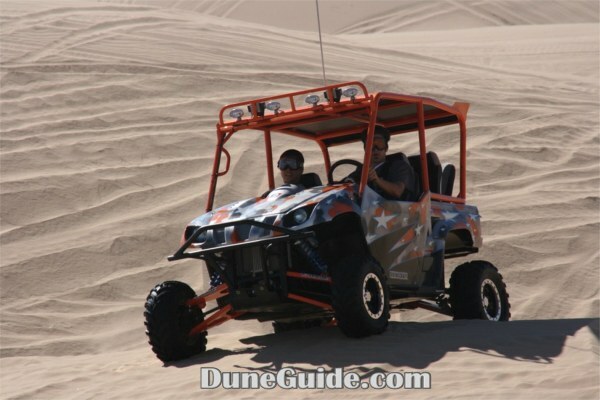 Add a link to www.DuneGuide.com on your website. 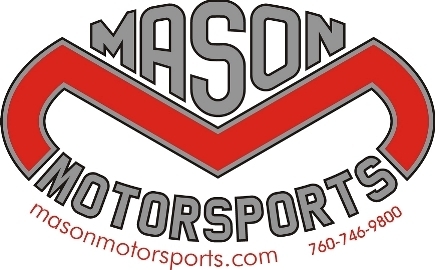 Be sure to let us know what name and URL you would like us to use.